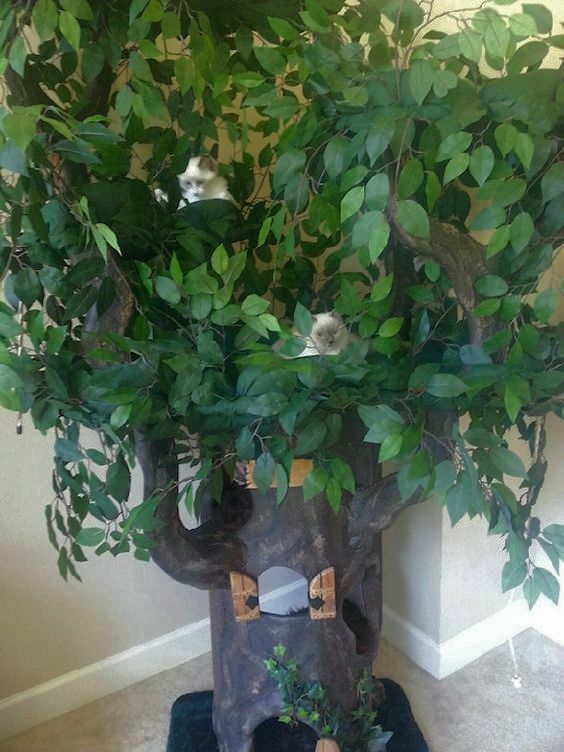 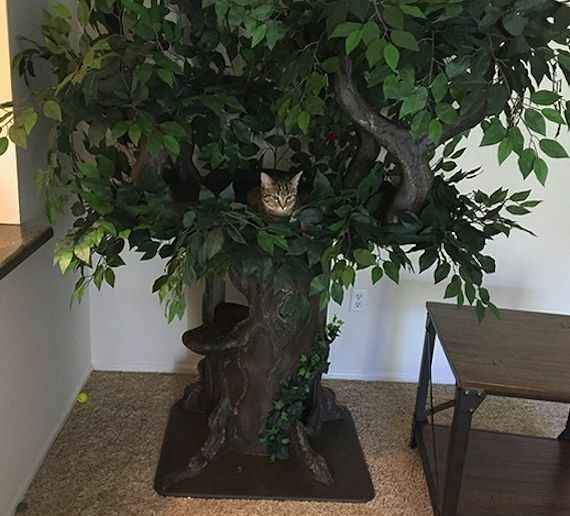 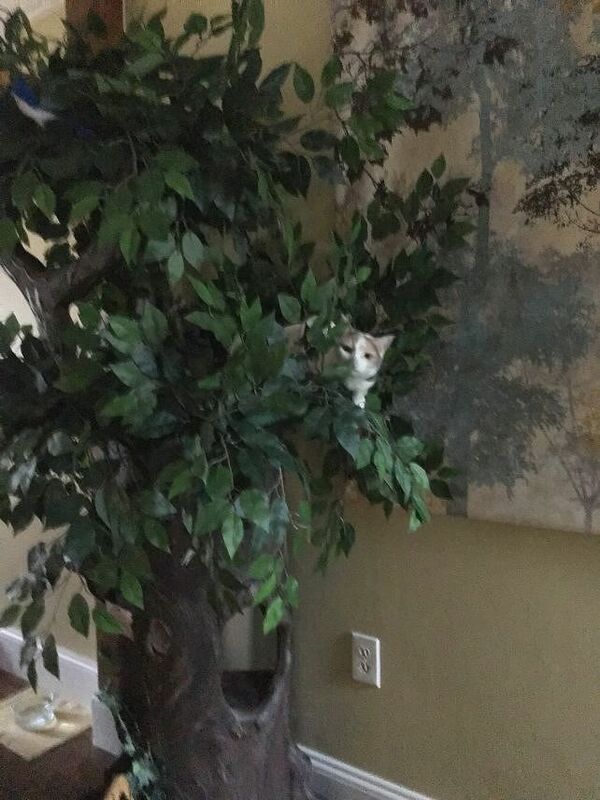 ​You can feel good about having these Amazing Cat Trees in your Living Area. 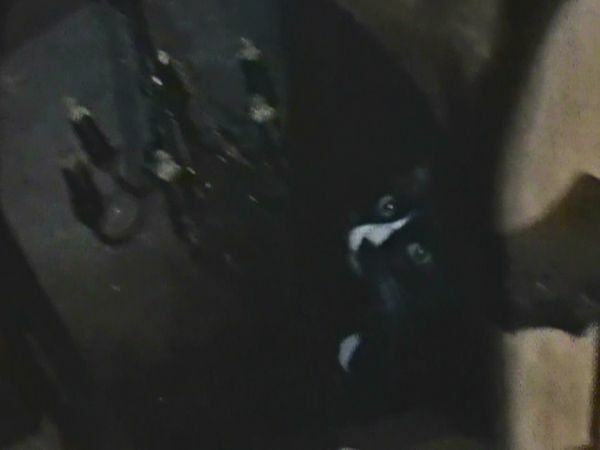 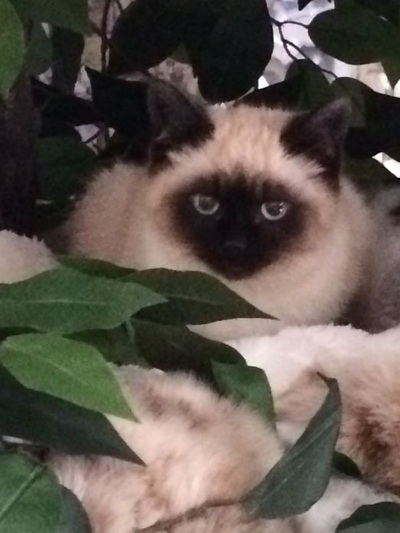 Rocky's Family helps and saves all kinds of animals, and Rocky is one that can't be released. 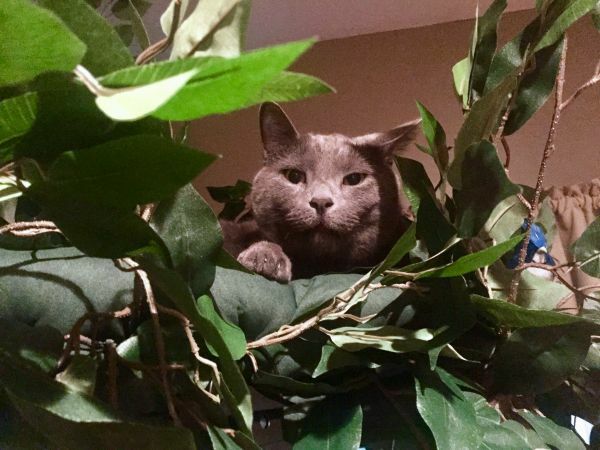 His family says he is so happy, he is playing and exercising more and even losing some weight. 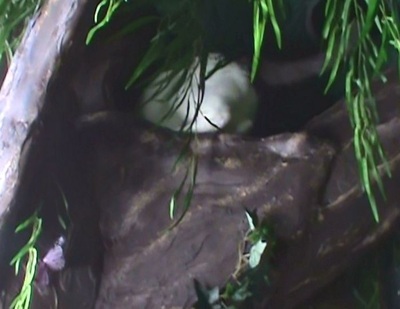 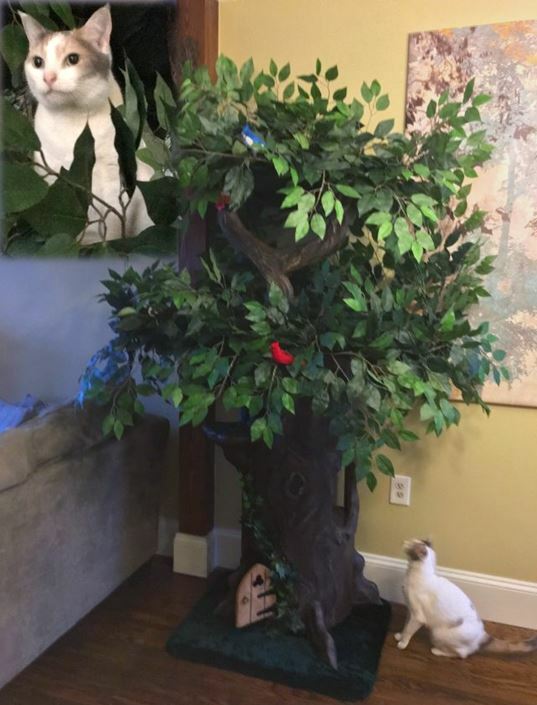 They said they can't believe how much the tree has improved his well being, so hopefully having another tree to make a forest home for him will make him even happier. 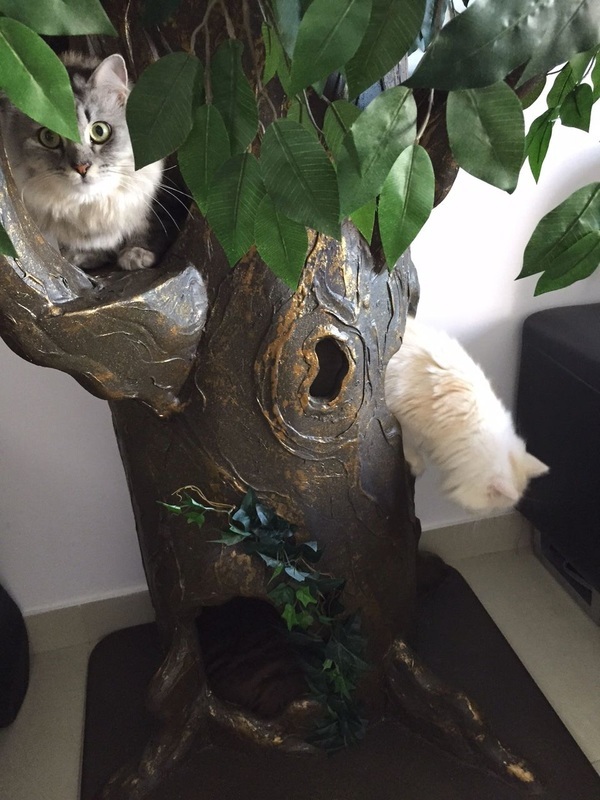 They said they will send more photos when they get the other tree. 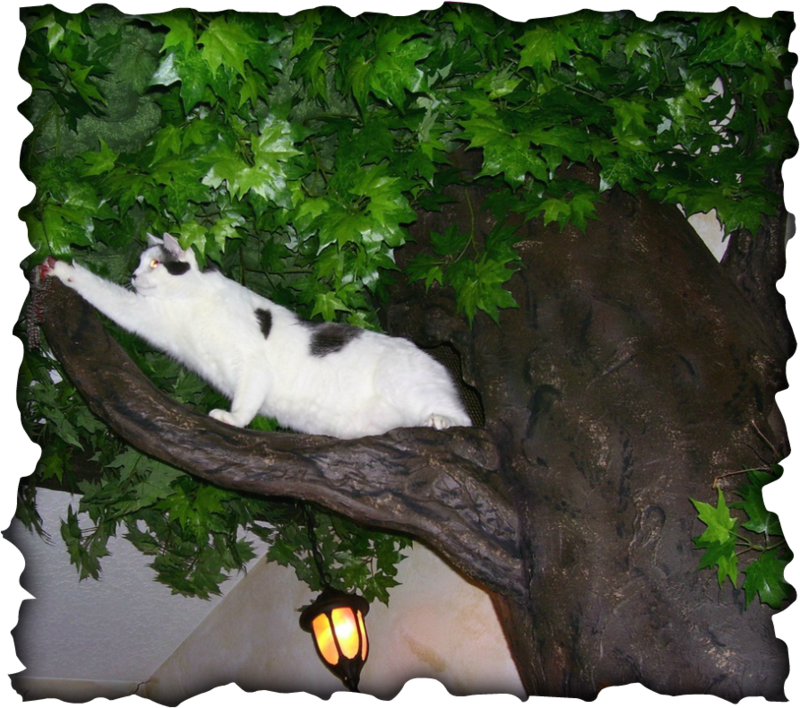 Our Heavy Duty Cat Trees are great for Large and Heavy Cats. 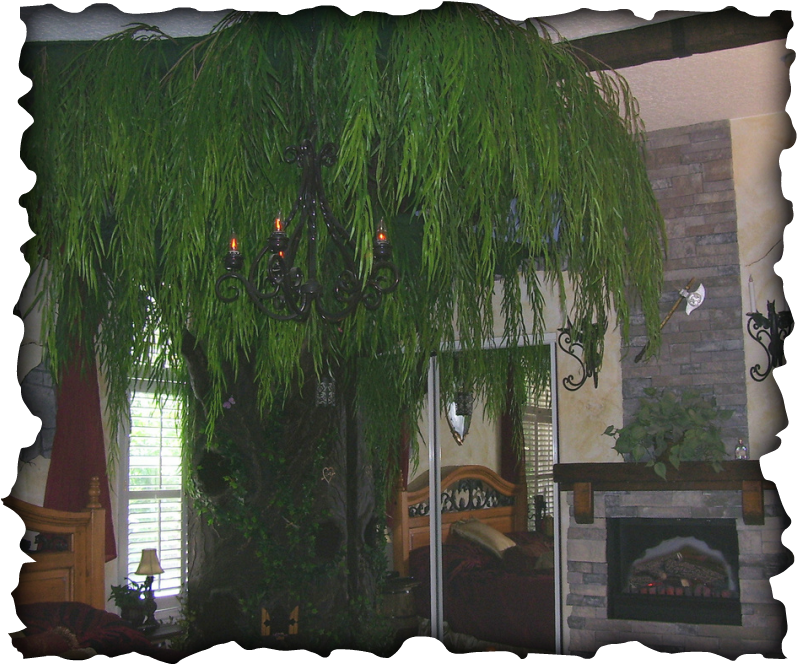 to design your Tree to match your own Decor. 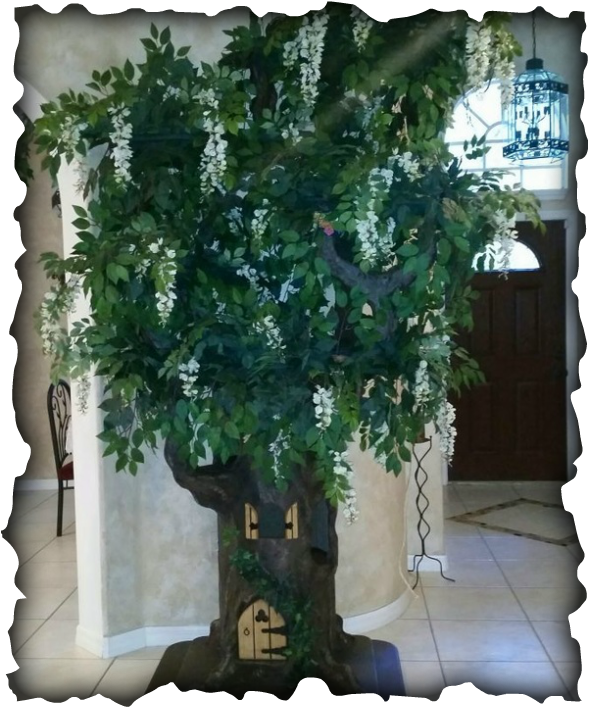 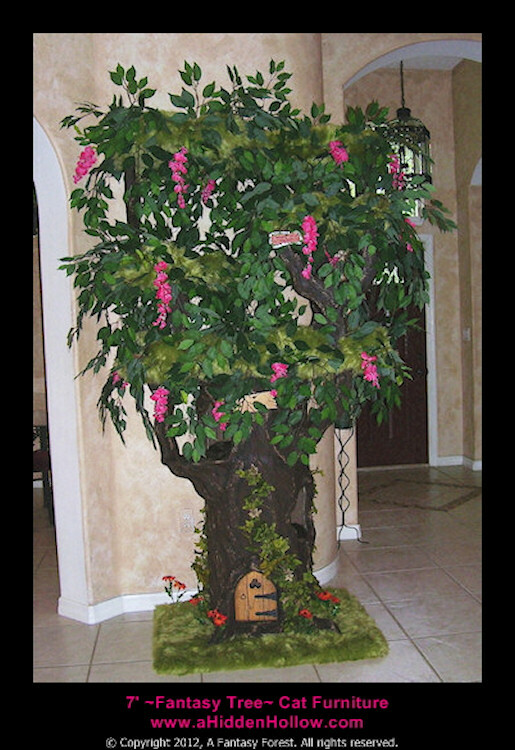 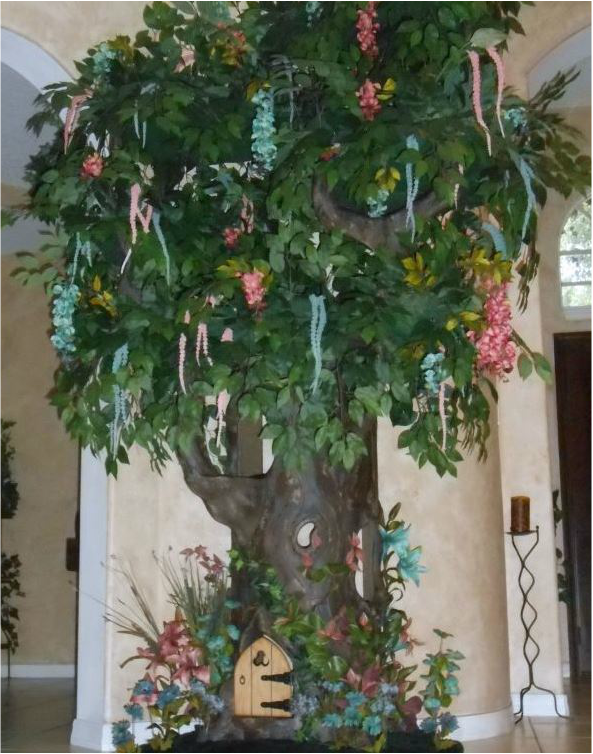 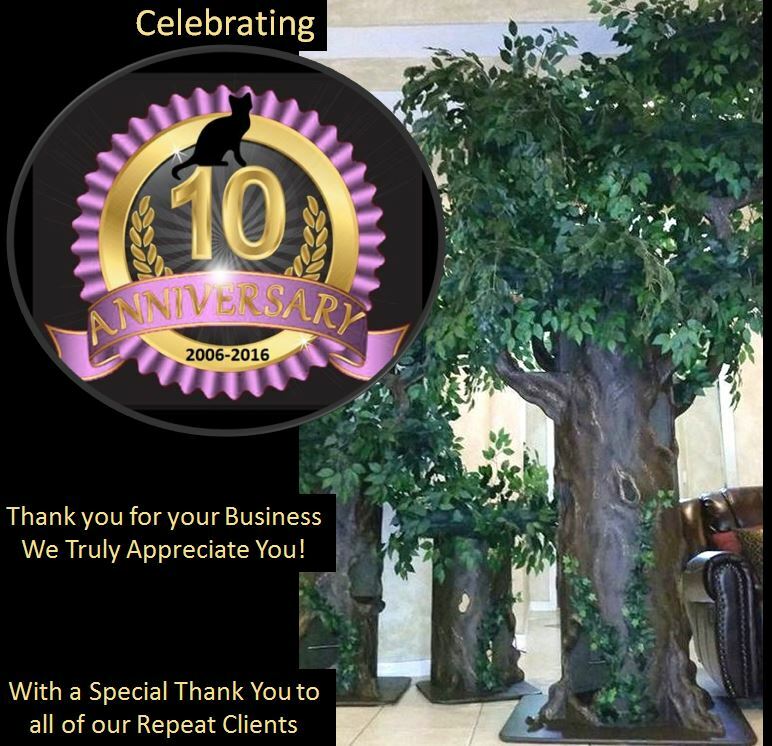 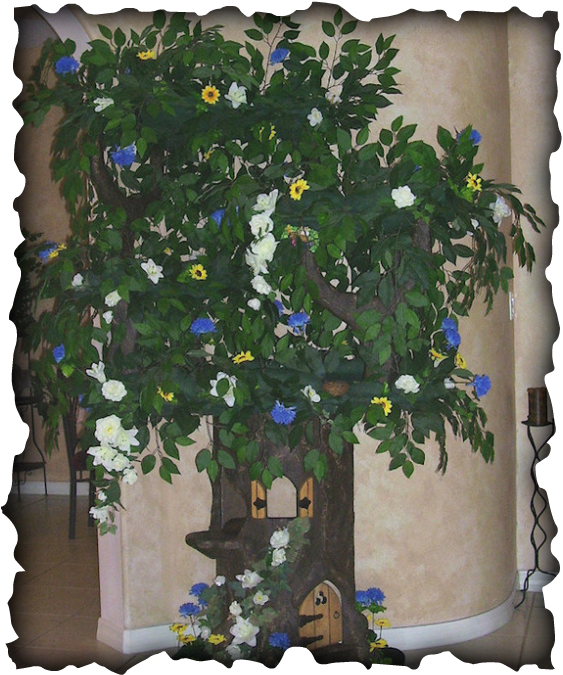 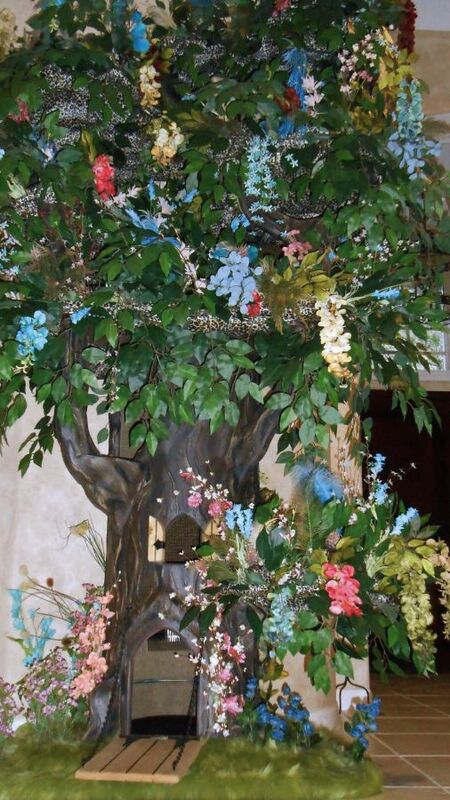 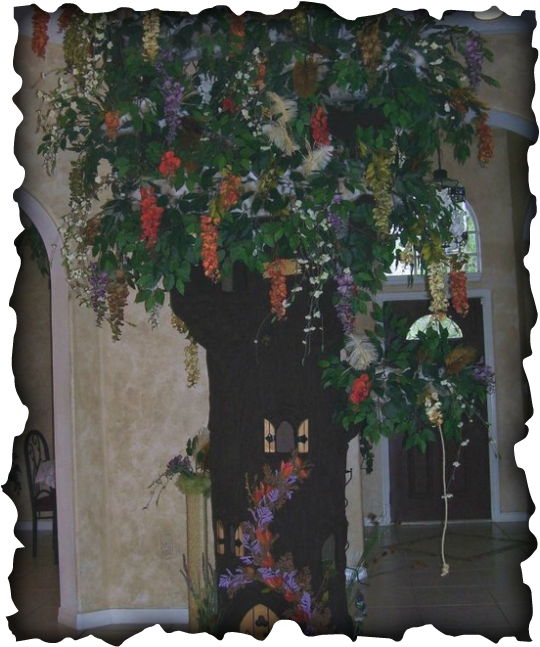 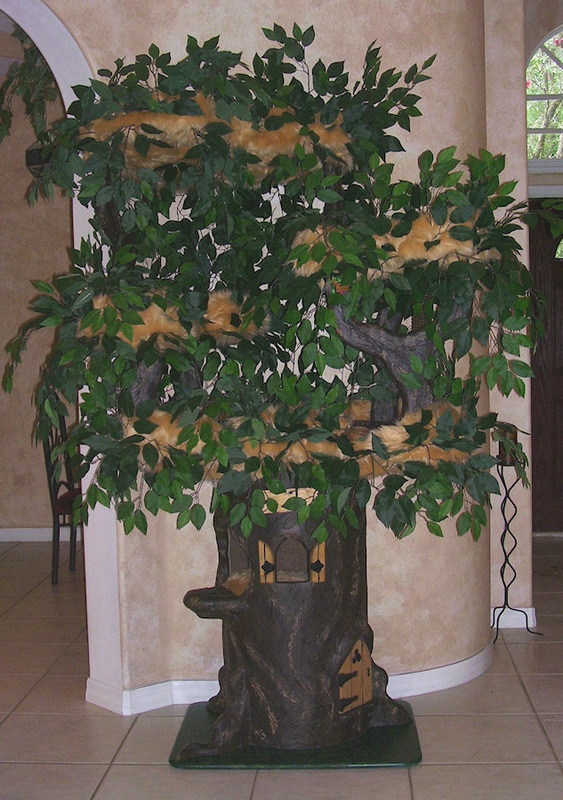 8' Magical Tree with 5 Tree top Platforms, extra lower platform, flowers, feathers, windows, drawbridge door and cheetah faux fur. 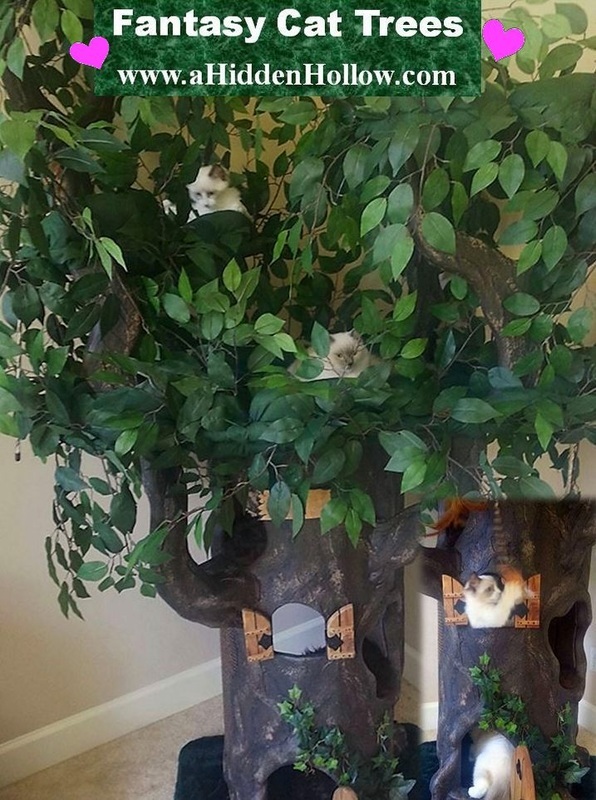 Spoil your Kitties with these life like Cat Trees. 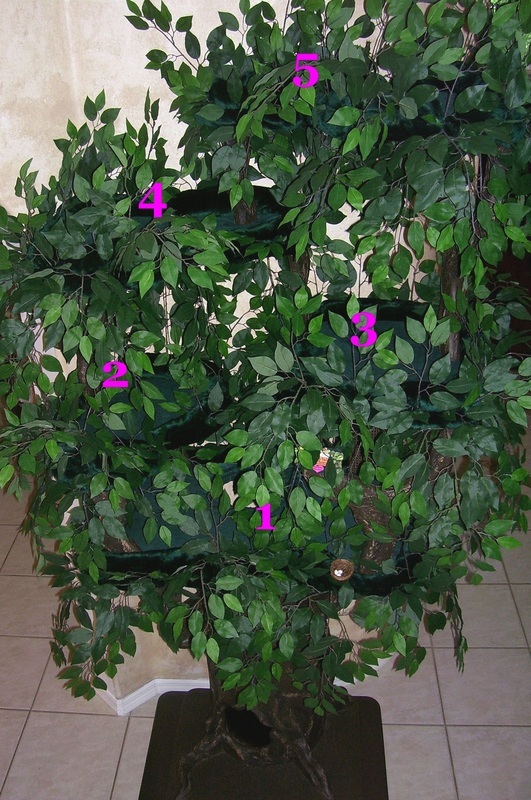 They are Hollow inside and have steps to take them up to the Tree top platforms. 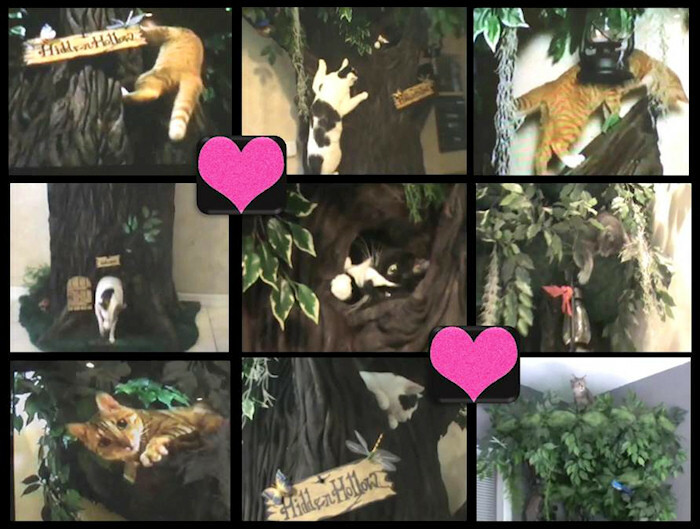 Bring out your Kitties WILD Side with the Ultimate Cat Tree. 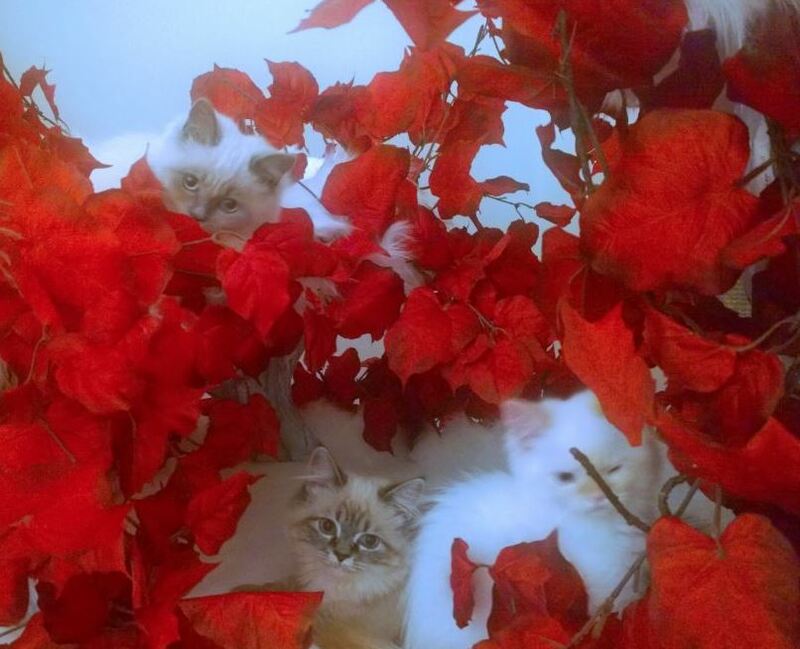 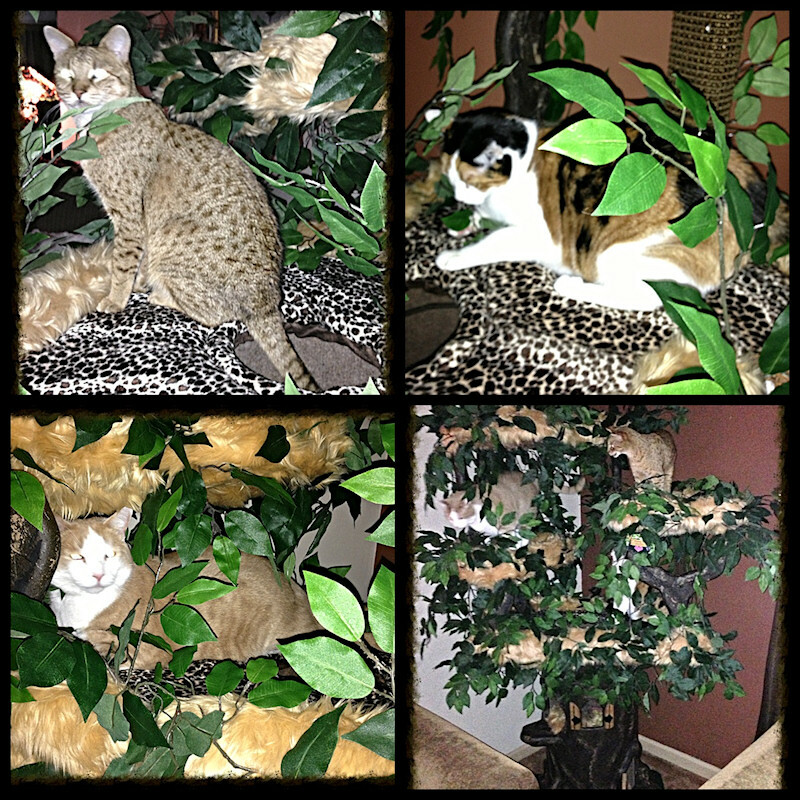 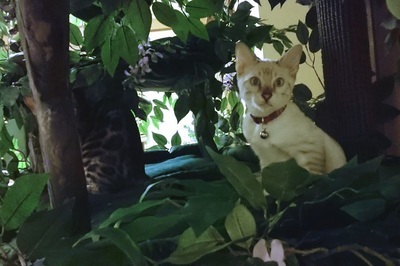 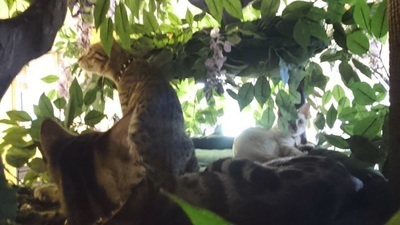 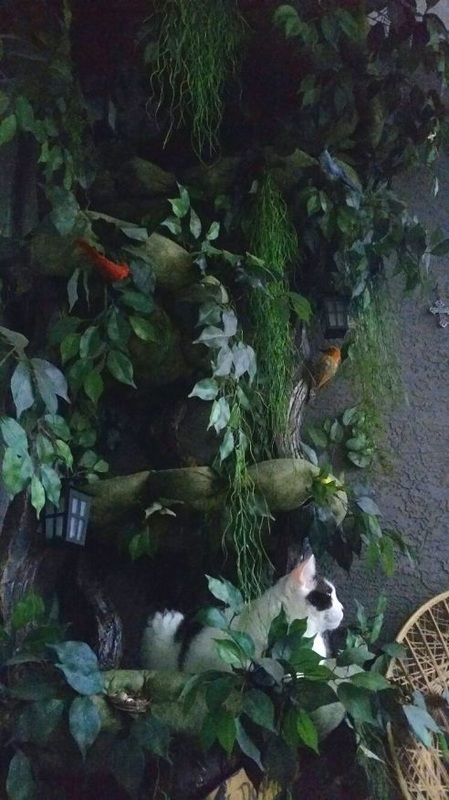 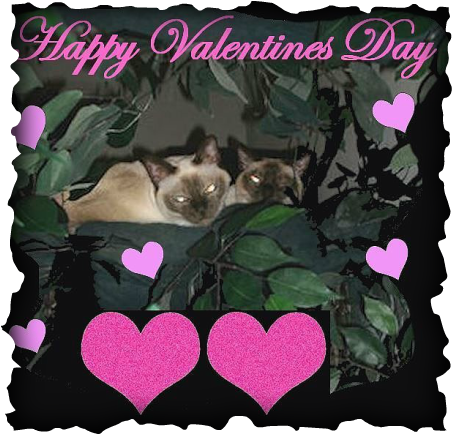 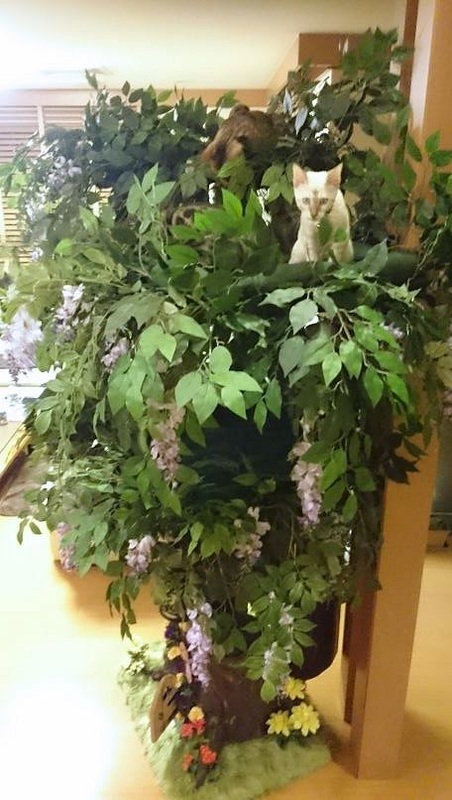 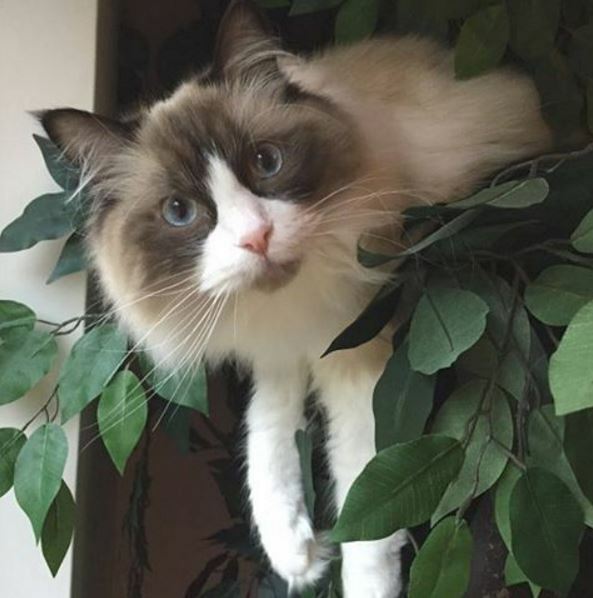 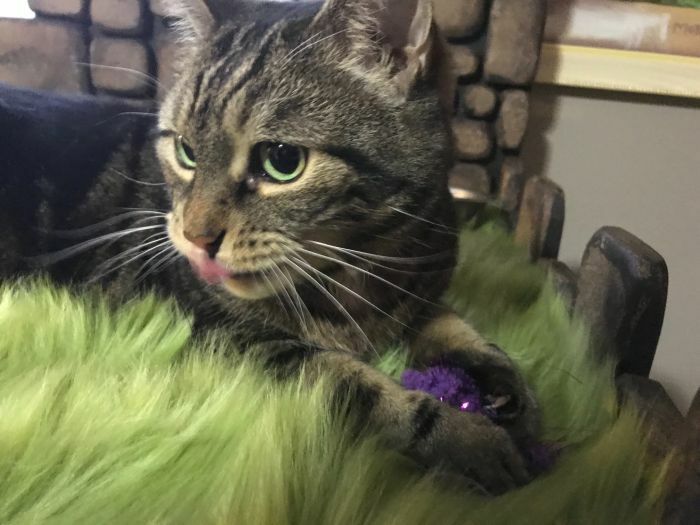 Create a "Forest" for your Kitties! 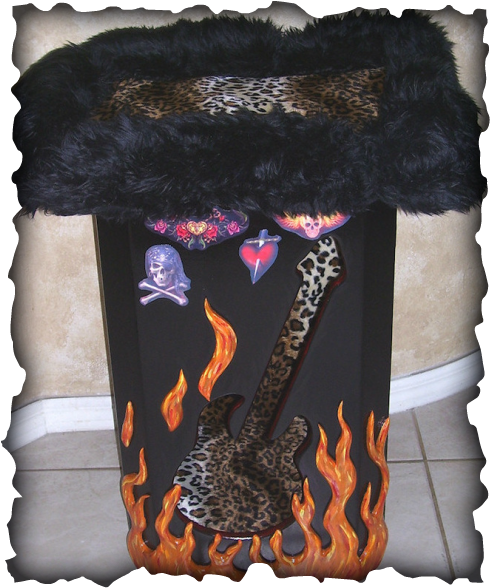 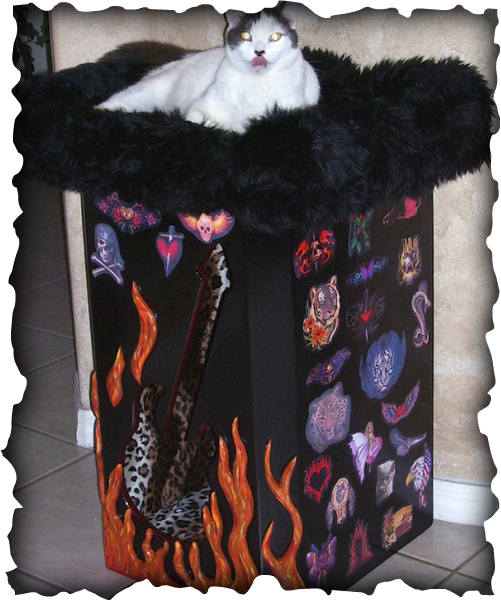 Beautiful Custom Cat Furniture that your Cat will Love. 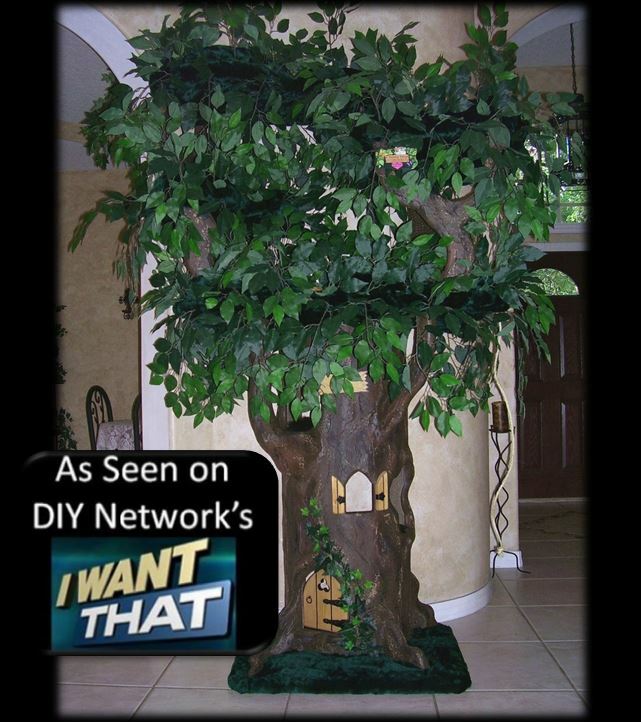 It will also look great in your Living area. 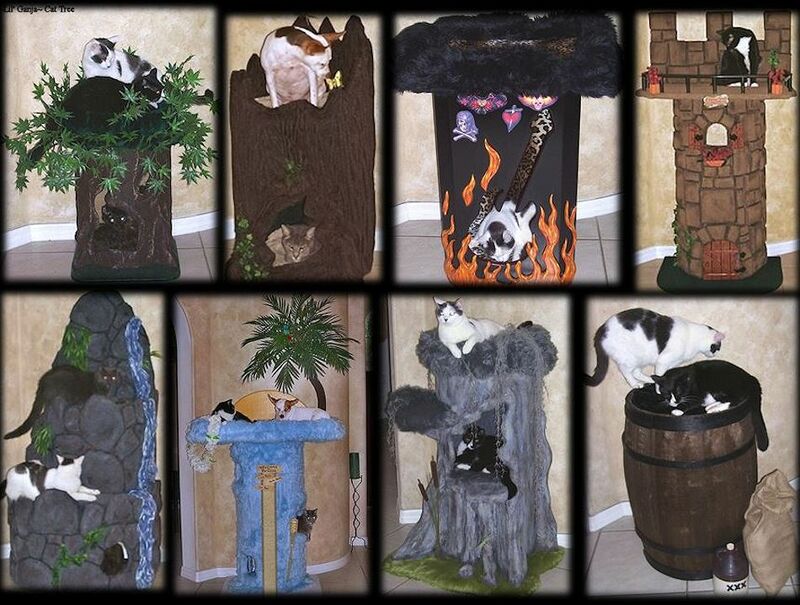 Cat Furniture you can feel good about having in your Living Room. 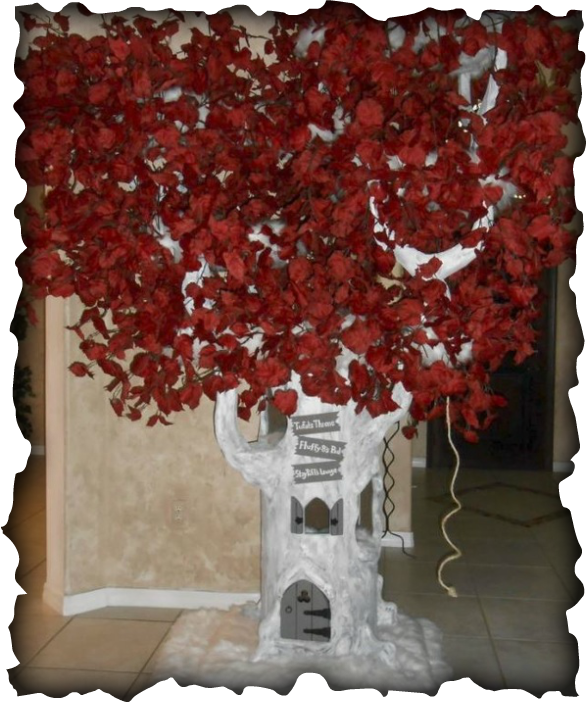 Design your Tree to match your own Decor. 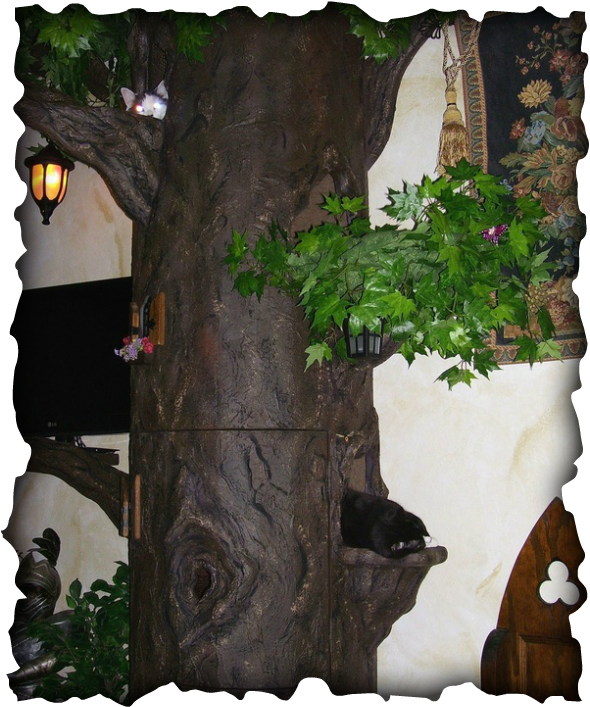 Create a Natural Looking Cat Tree or create a Fantasy Cat Tree. 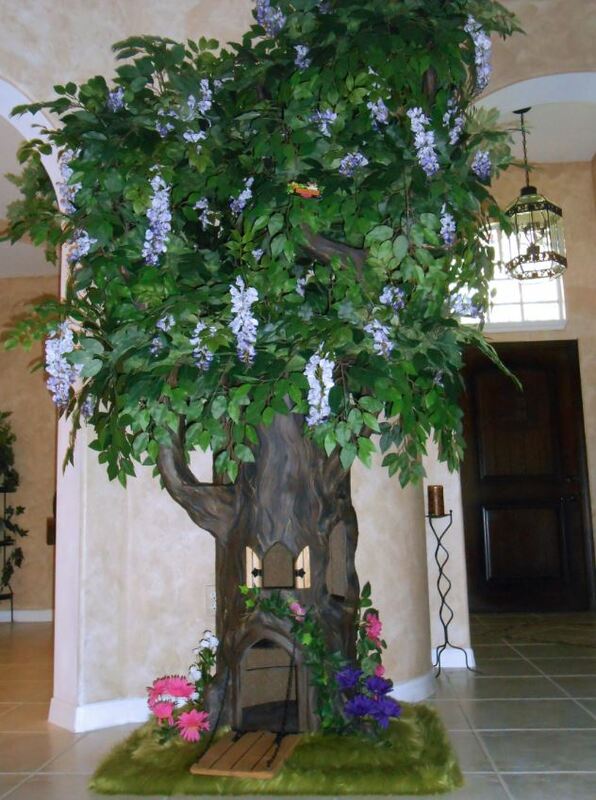 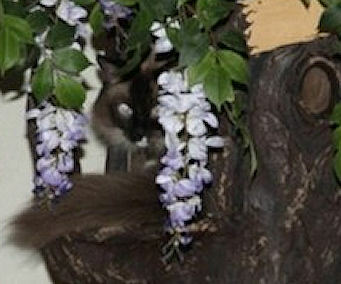 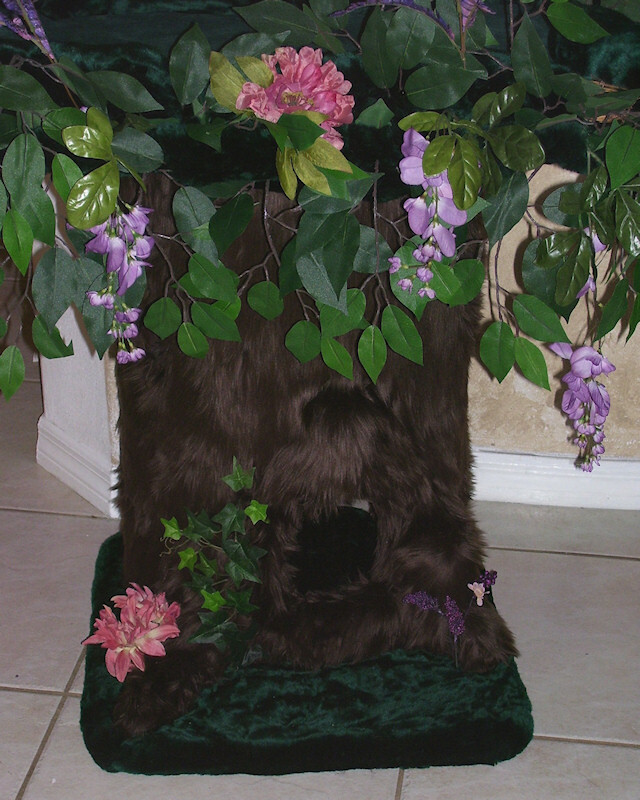 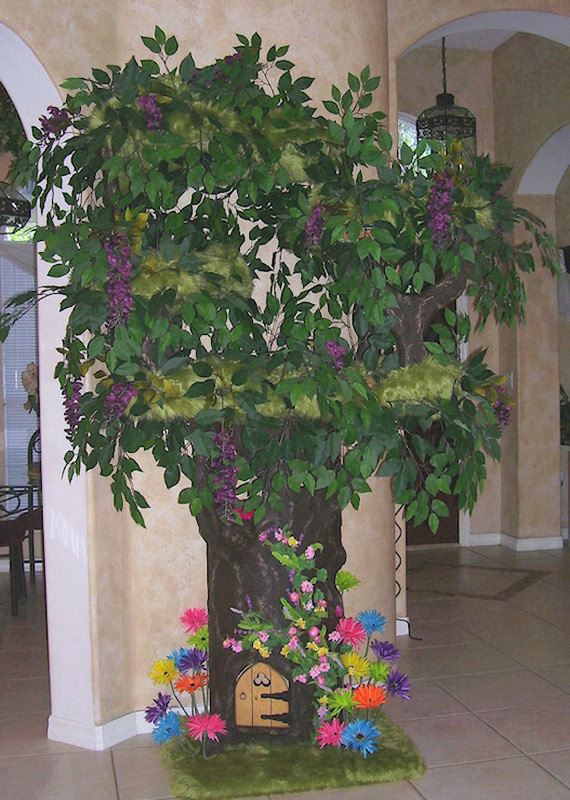 Our Client wanted Purple Luxury Fur on the Tree top Platforms of her 6' Hidden Hollow Cat Tree. 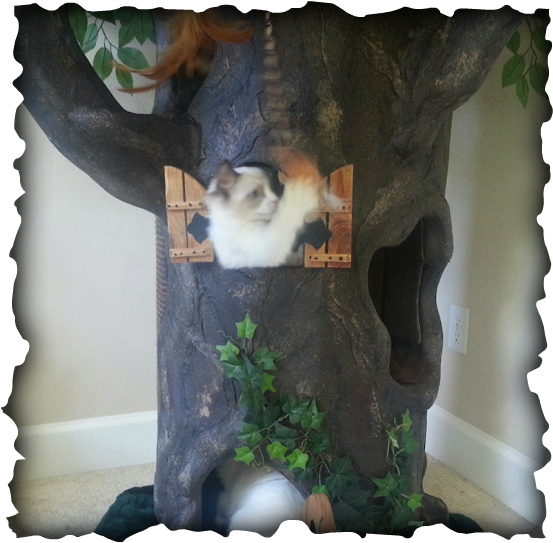 Adorable Canadian Cutie "Monkey" on her ~Kitty Chateau~ Cat Castle Condo. 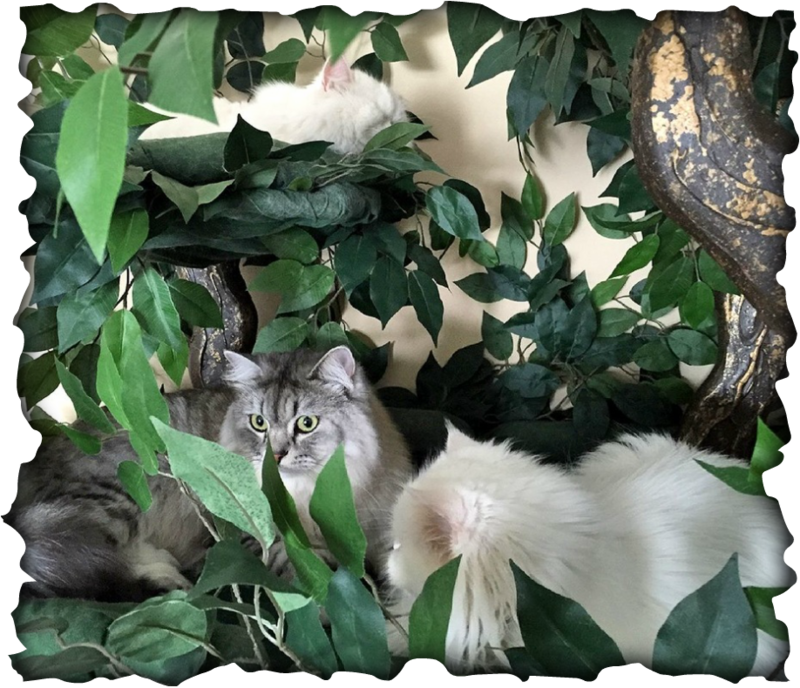 Spoil your Kitties with their very own Mediterranean Villa! 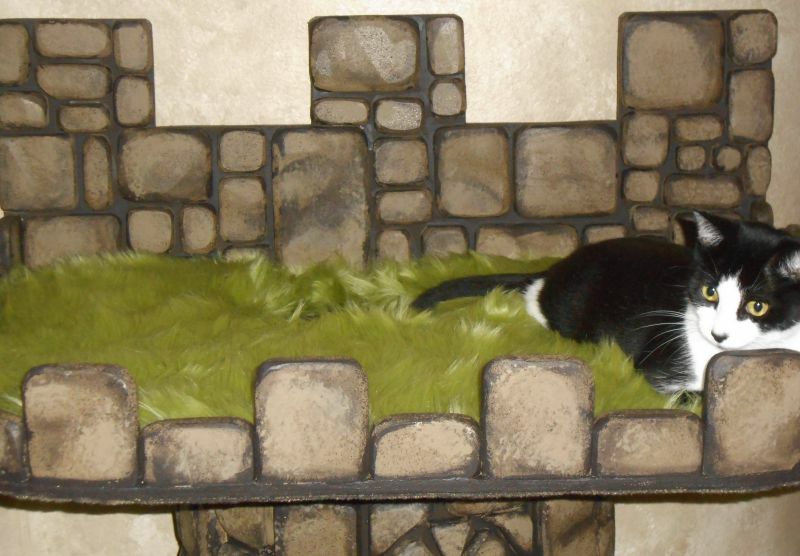 This Castle has 3-D effect "Stone Work" and a private Balcony for your Cats to lounge on and overlook their Kingdom. 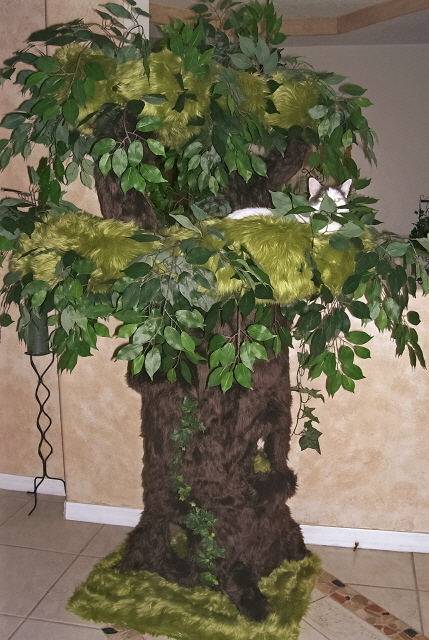 6' Fantasy Cat Tree with Adorable "Hayley" and "Emily"
“Ramesses” 30 lbs. 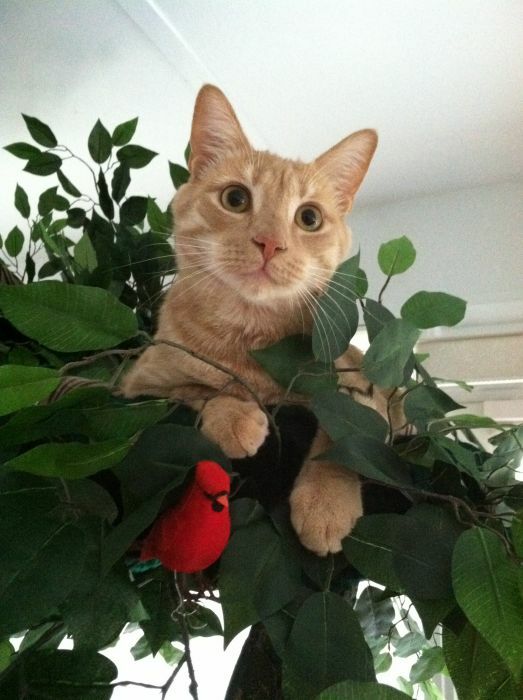 and “Romeo” 25 lbs. 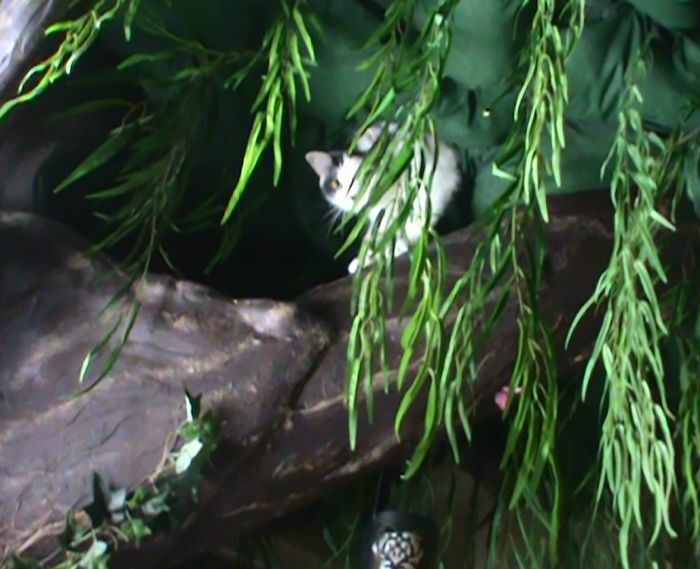 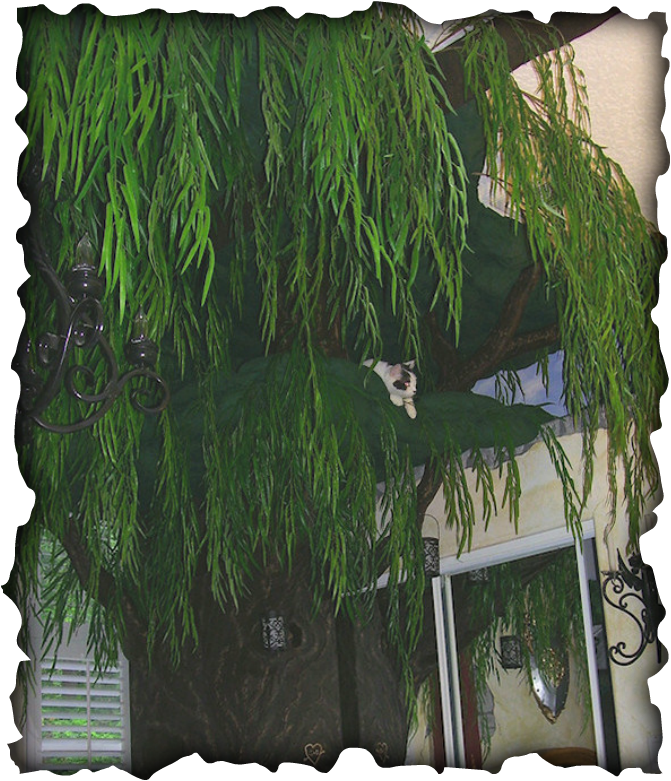 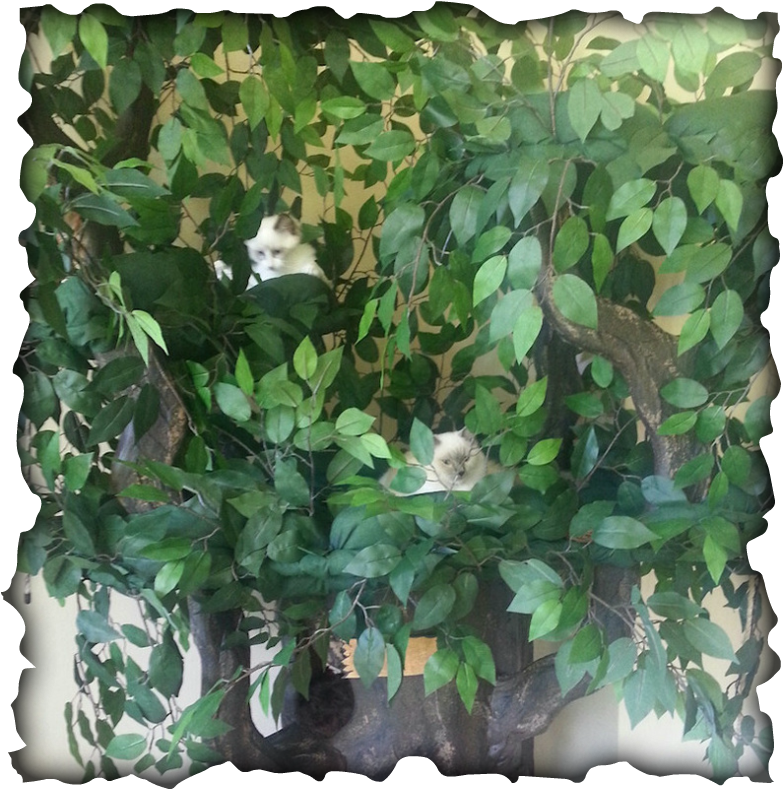 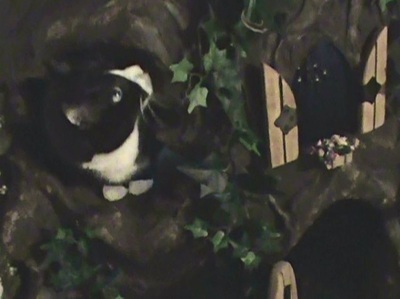 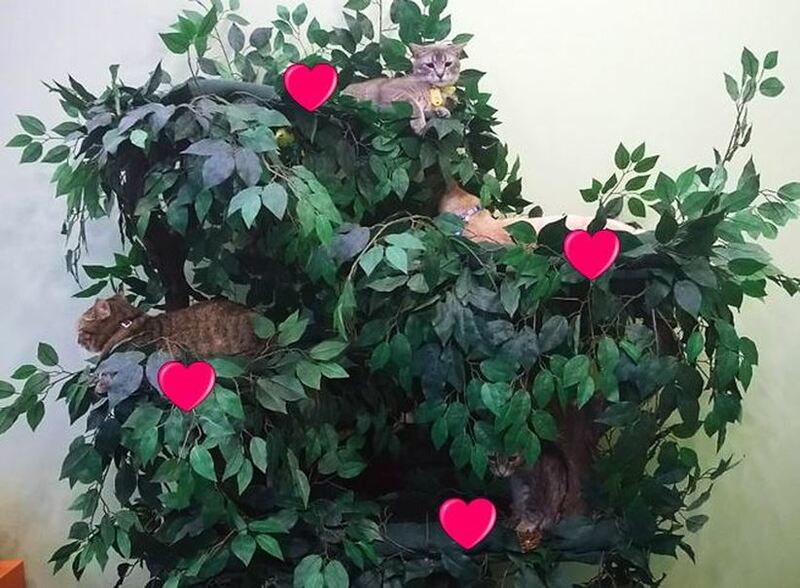 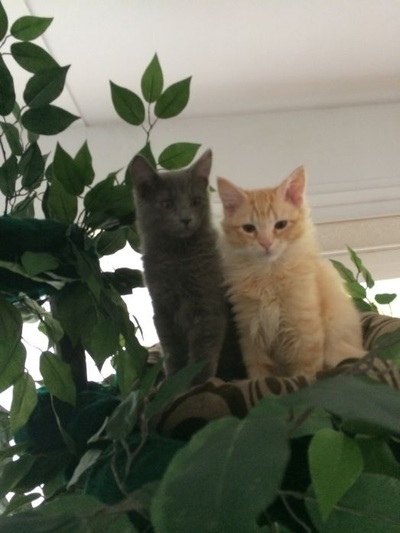 Can you find the 2 cuties in the Tree tops of their Fantasy Cat Tree? And make your kitties Feline Fantasies come True! 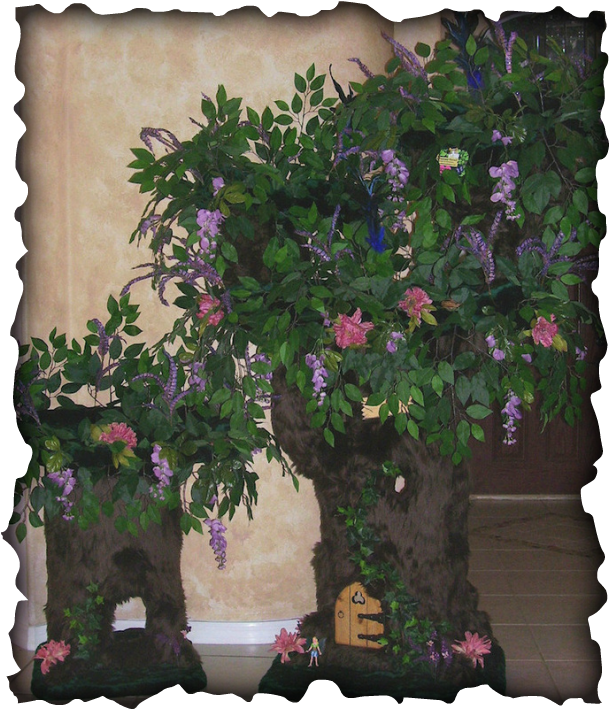 Please visit us at www.aHiddenHollow.com for more information. 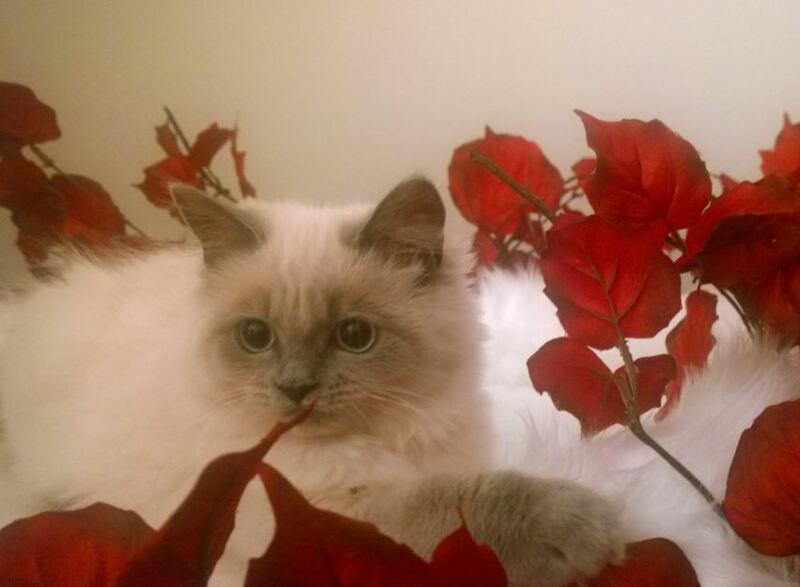 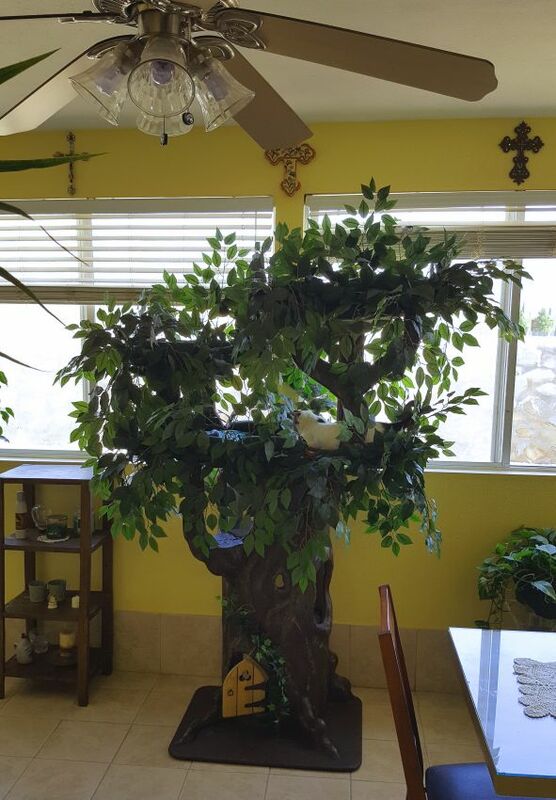 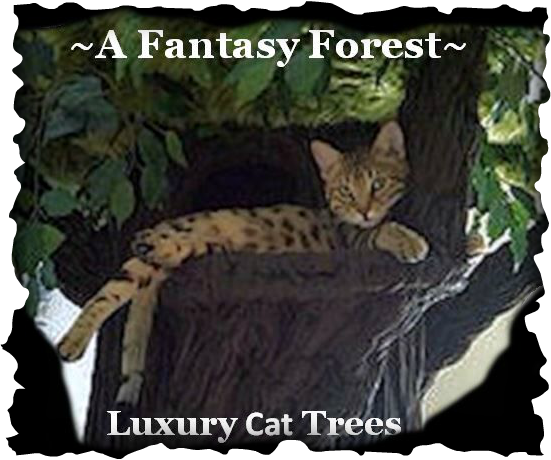 Make natural realistic looking Trees or design a bright, fairy tale like cat tree. 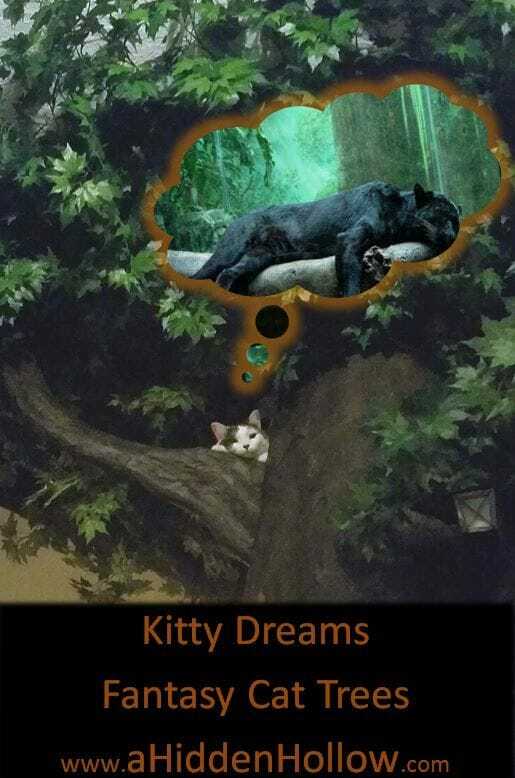 Making Kitty Dreams come True since 2006! 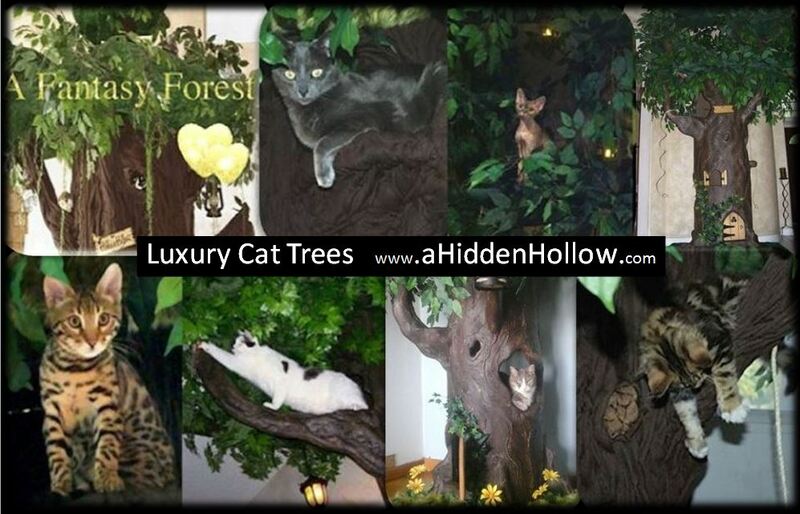 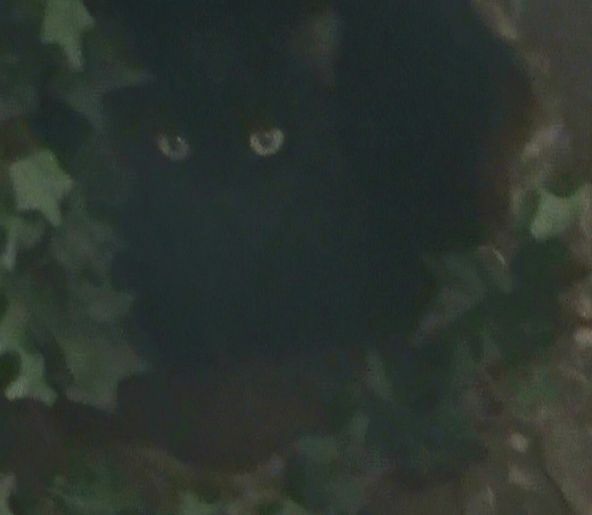 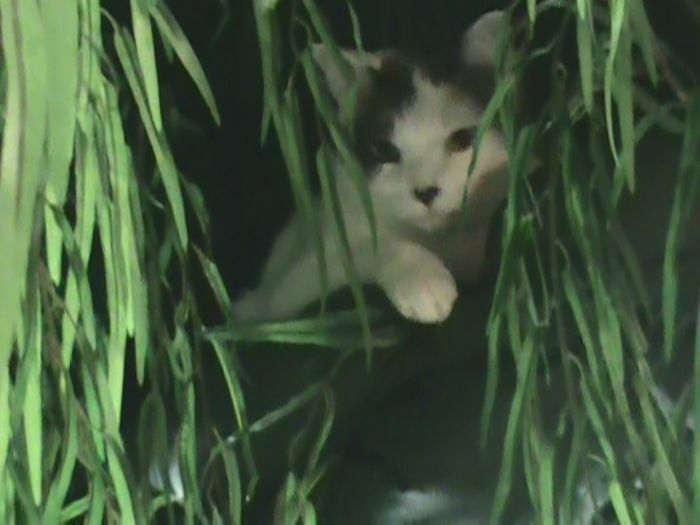 Please visit us at www.aHiddenHollow.com and find a Unique Tree for your Special Kitties. 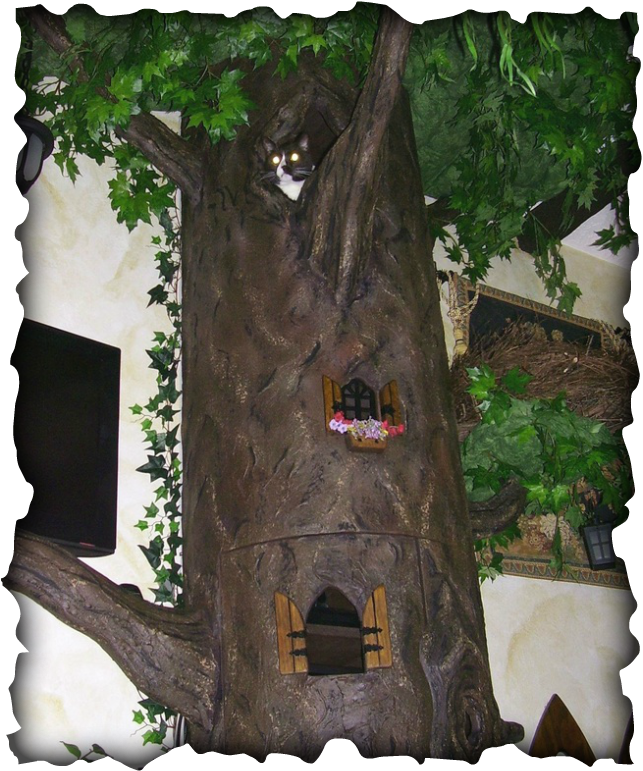 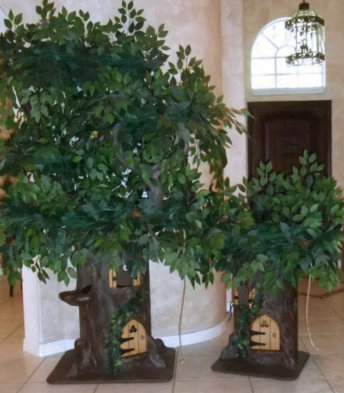 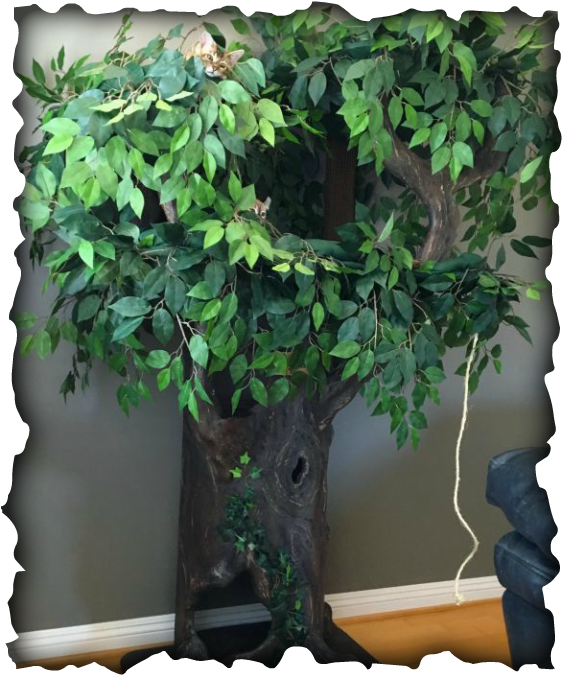 ​10' Tall ~Magical Cat Tree~ with 5 Tree top platforms and a lower platform for your cats to walk out on from inside the Tree Trunk. 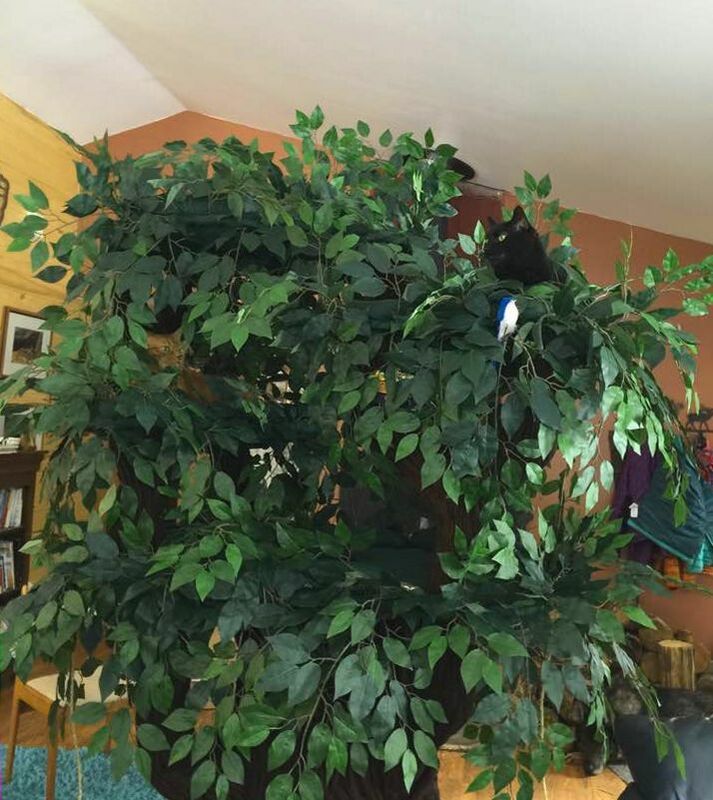 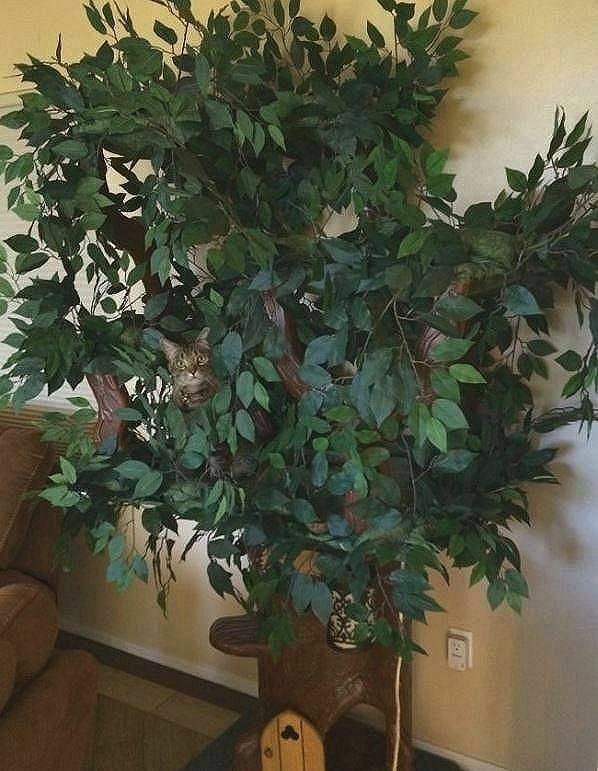 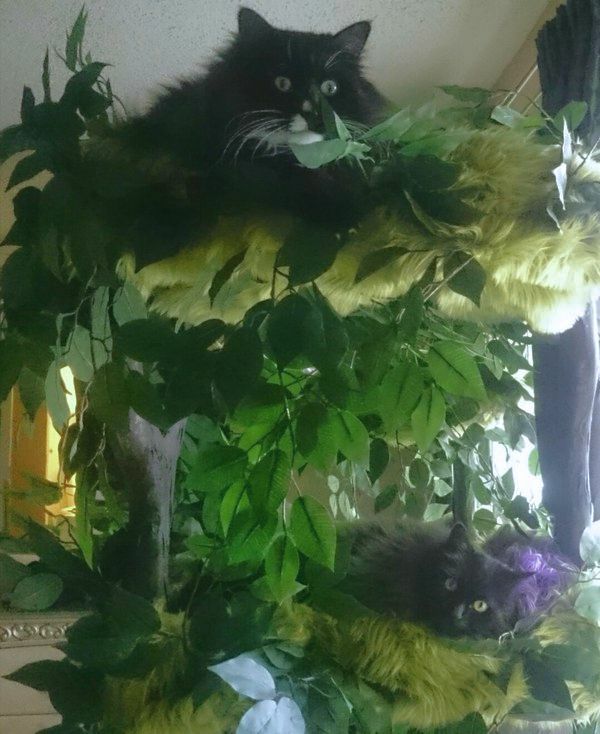 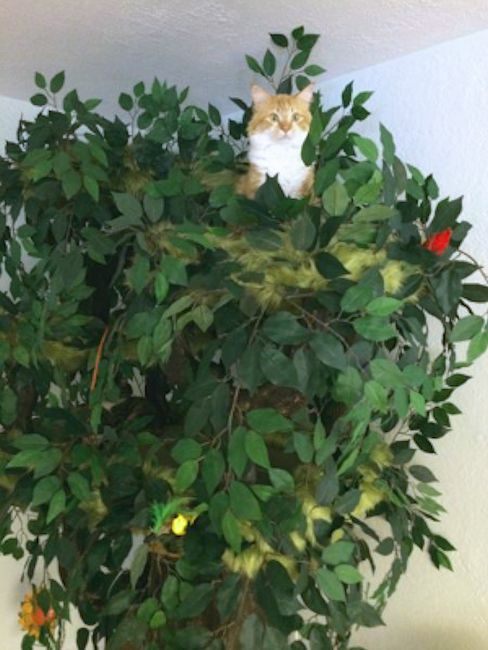 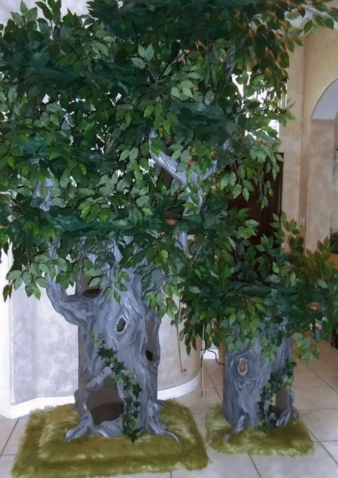 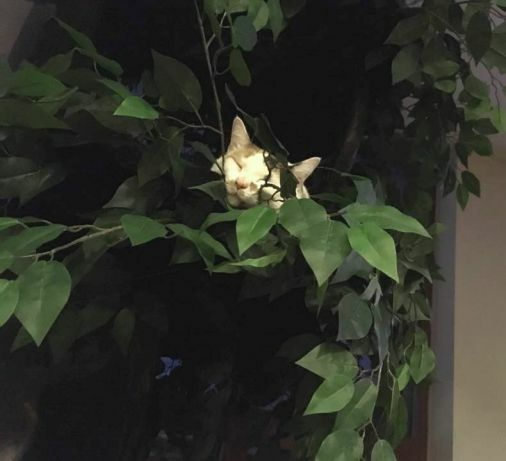 Super Large Cat Trees that look like real Trees with Leaves. 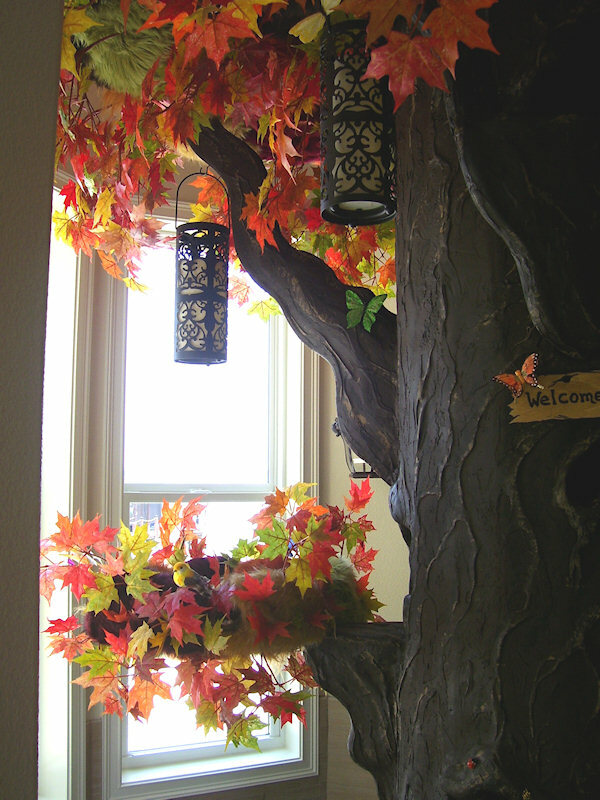 Bring the great outdoors inside. 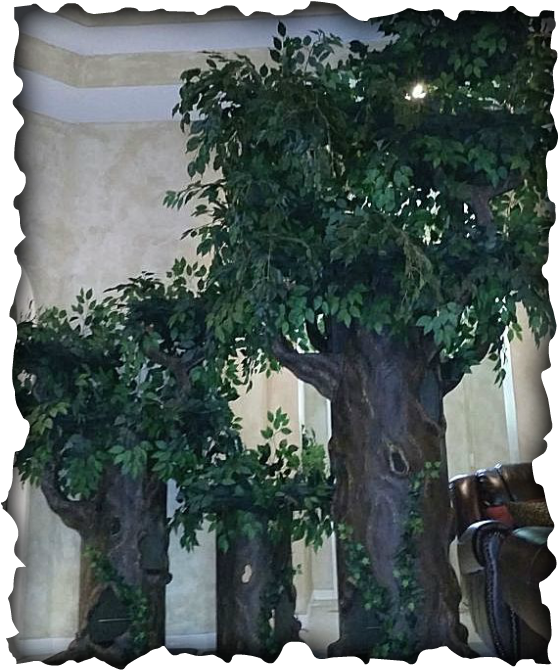 Trunk of their Fantasy Tree. 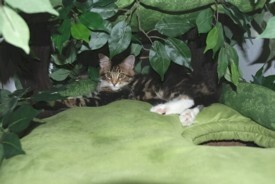 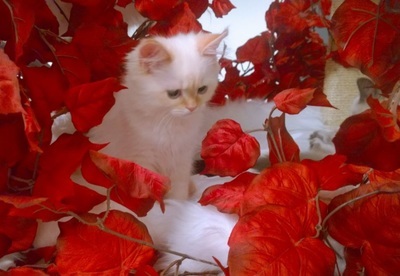 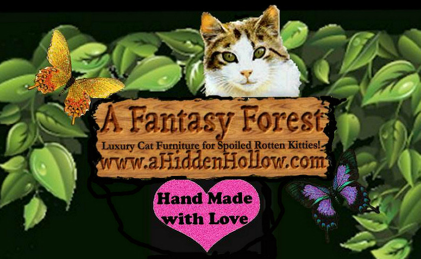 Please visit us at www.aHiddenHollow.com and make their Feline Fantasies come True this Christmas! 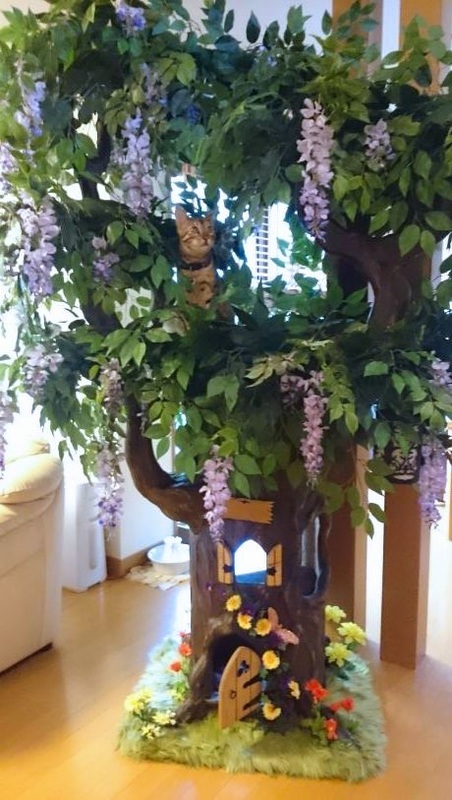 First Cat Tree in Japan, Thank You! 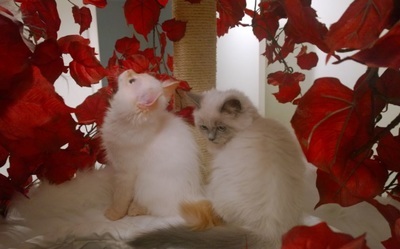 Beautiful Cats!!!!! 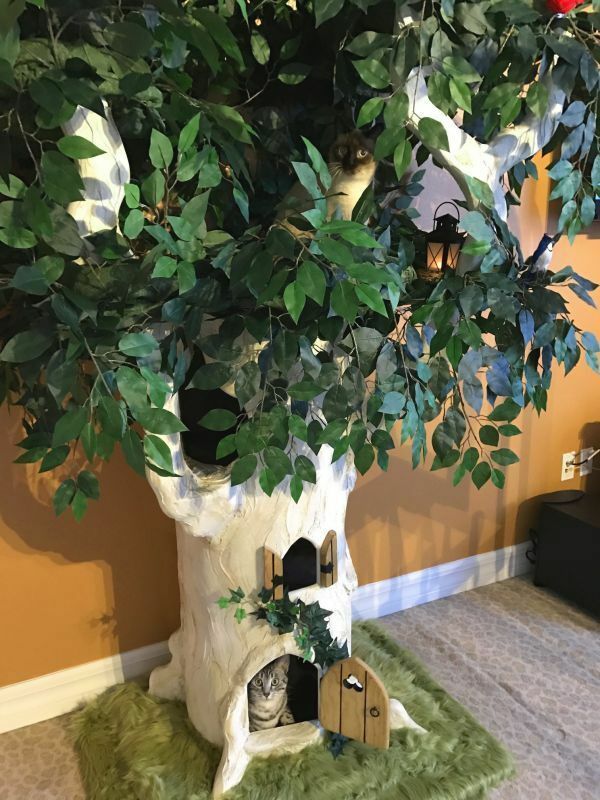 Unique Cat Trees for Spoiled Rotten Kitties! 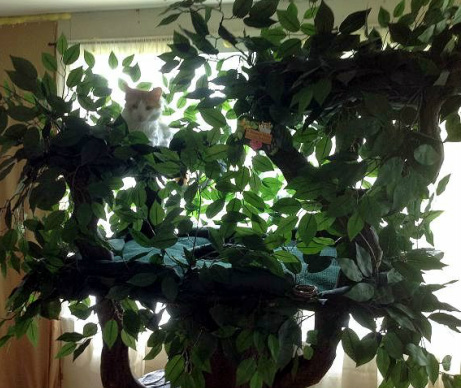 Cat Trees you can feel good about having in your Living Room. 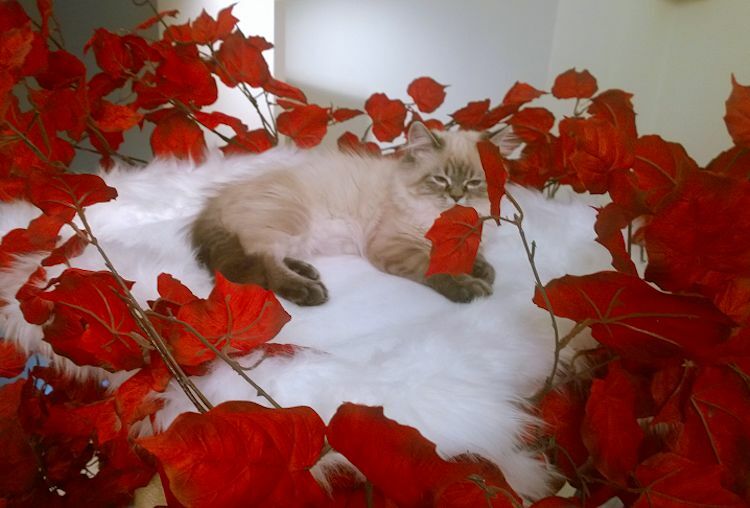 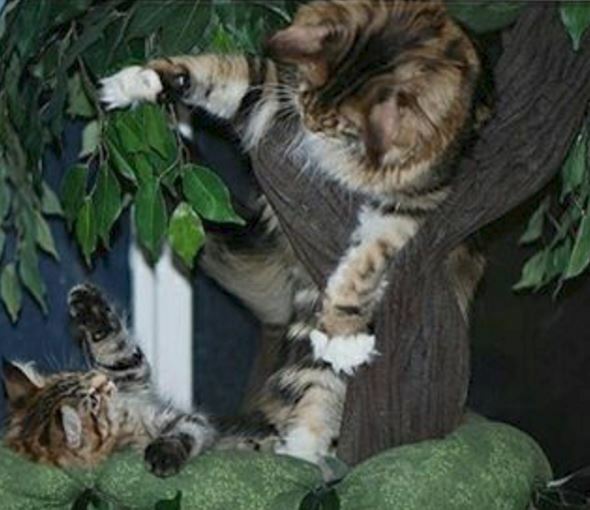 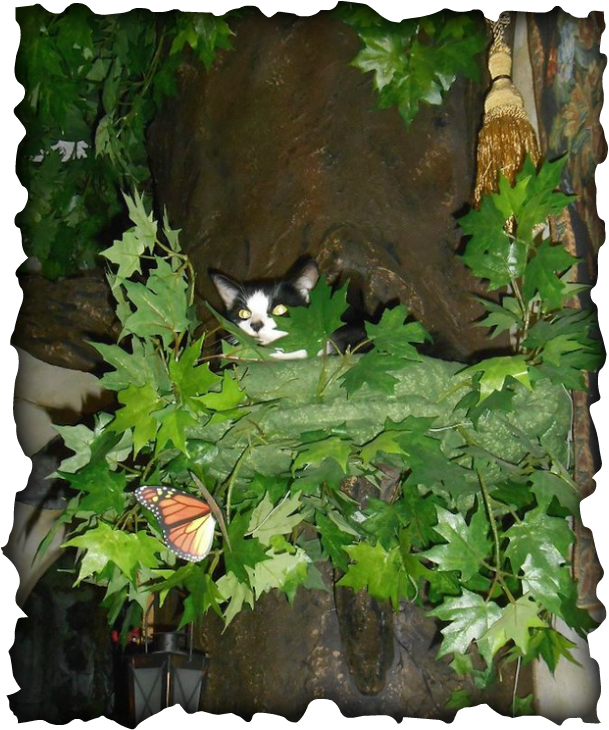 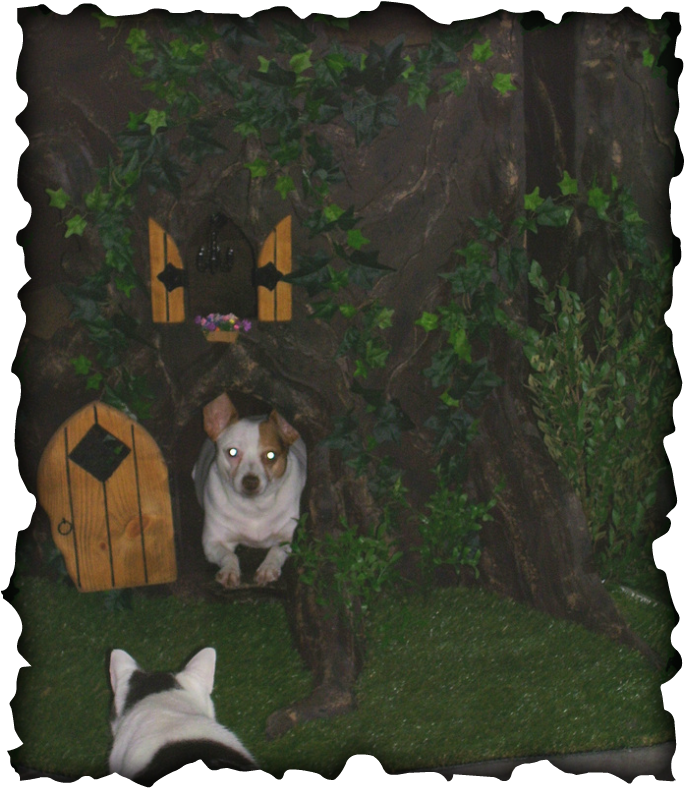 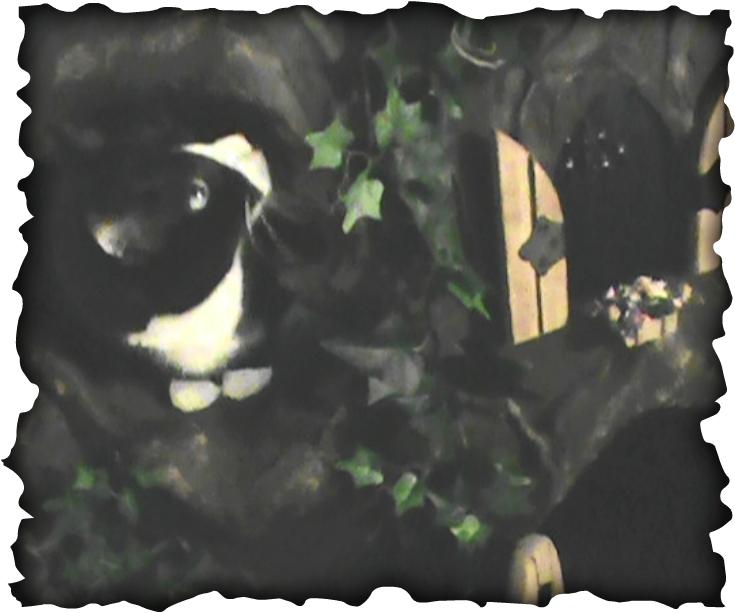 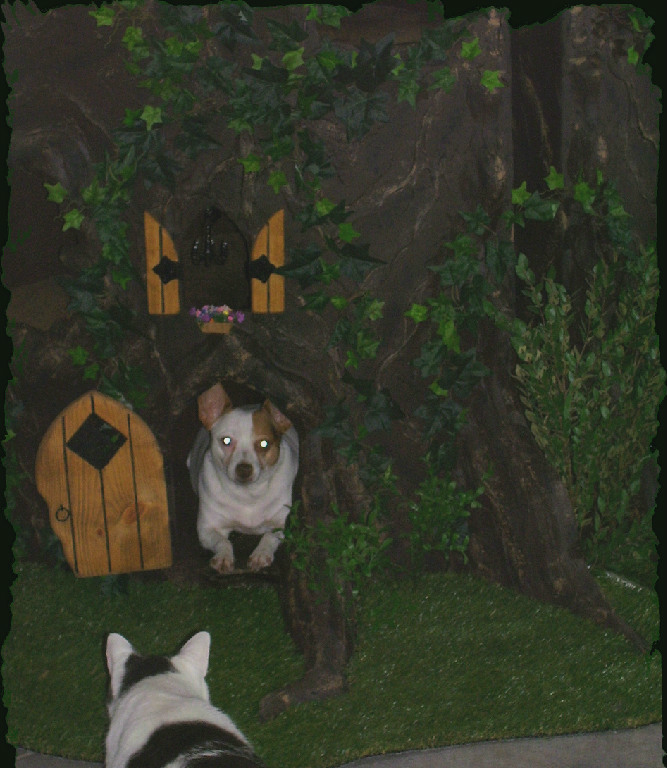 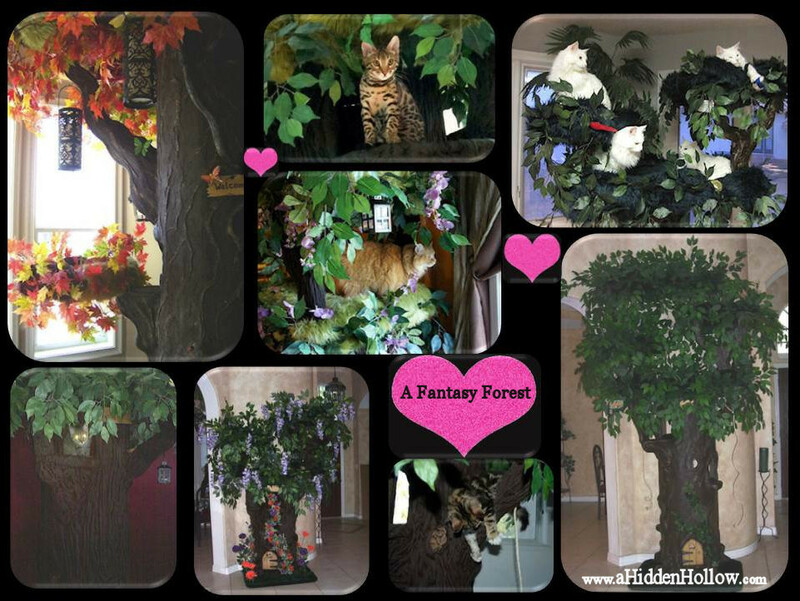 Create ~A Fantasy Forest~ for your Kitties to play and jump back and forth on. 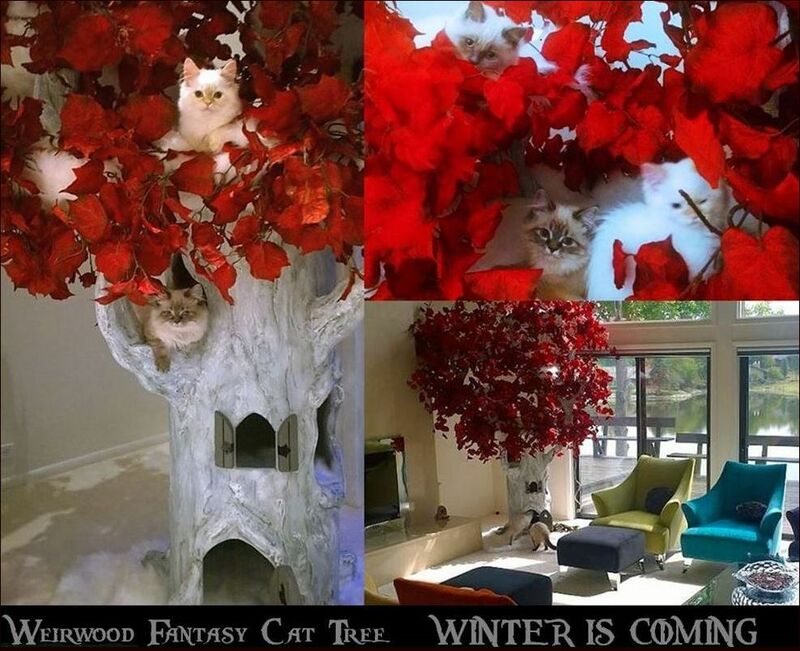 Game of Thrones Weirwood Tree Colors. 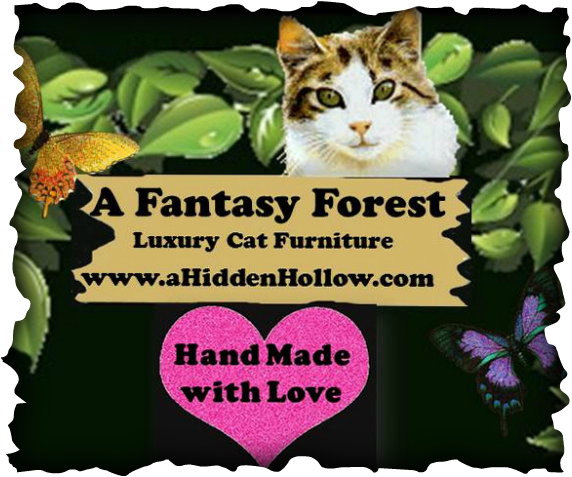 to see more information, photos, videos, client emails and to place an order. 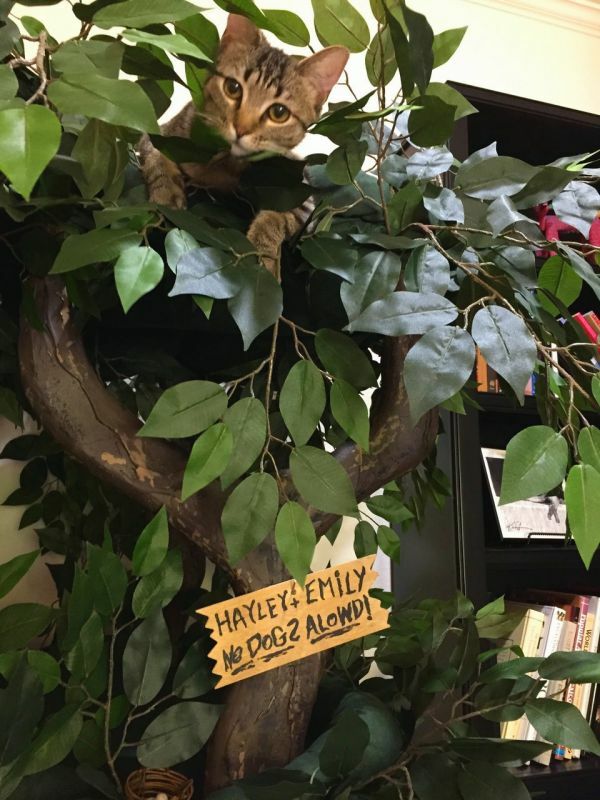 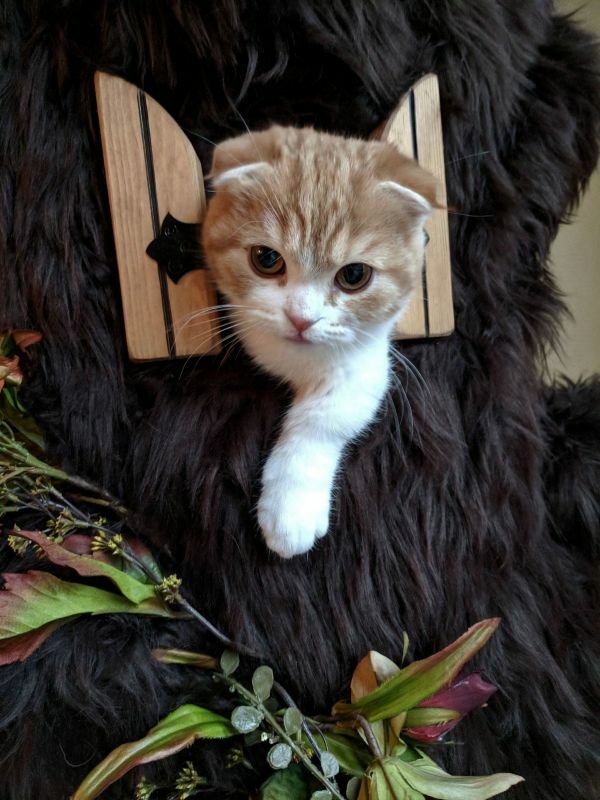 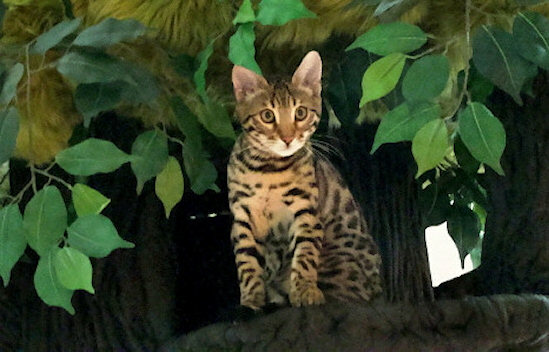 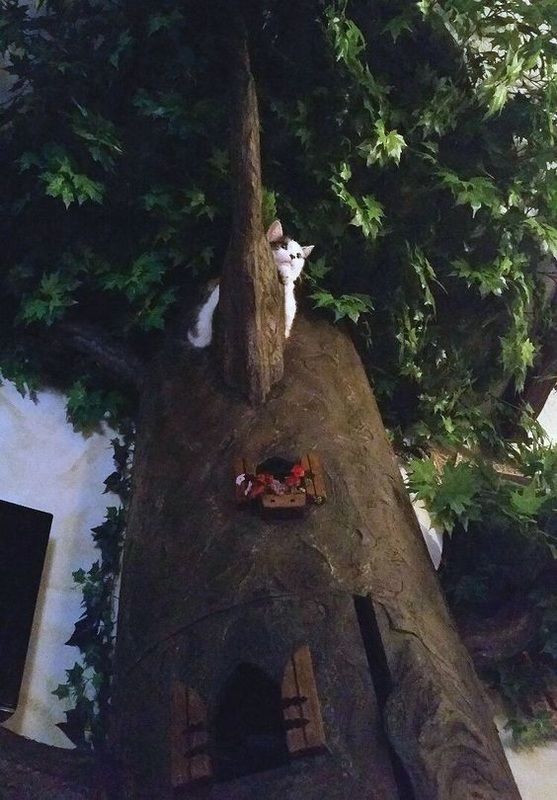 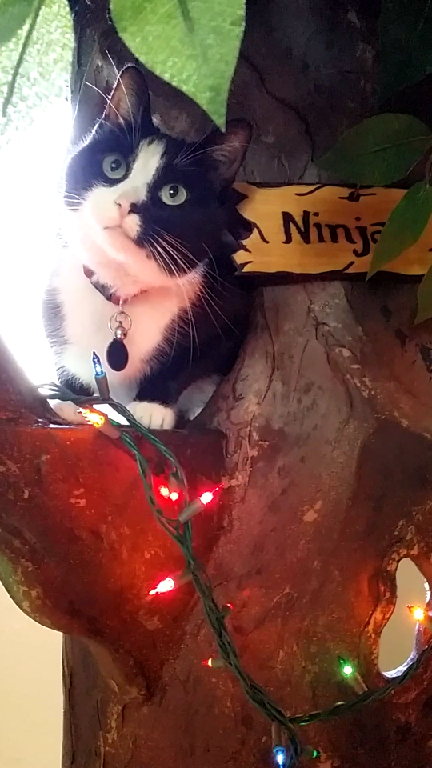 Cute Kitty Save kitties on their 6' tall Fantasy Cat Tree at The Charming Cat Café in TX. 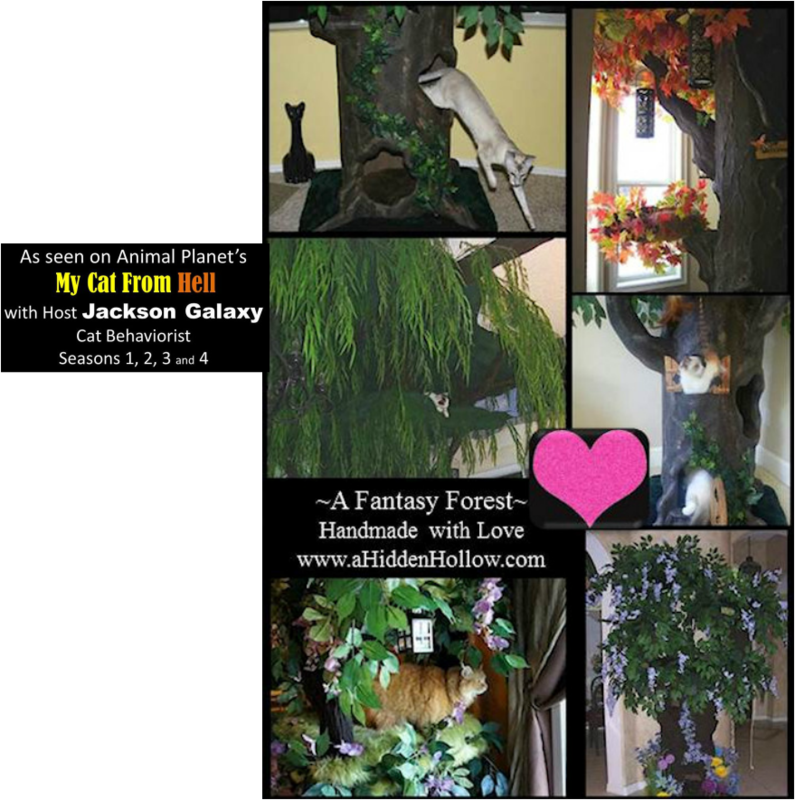 Amazing Cat Tree "Puffy Cheeks"
7' ~Fantasy Cat Tree~ as seen on DIY Network's I WANT THAT show, starring "Bella"
Please visit us at www.ahiddenhollow.com and create your own Fantasy Cat Tree. 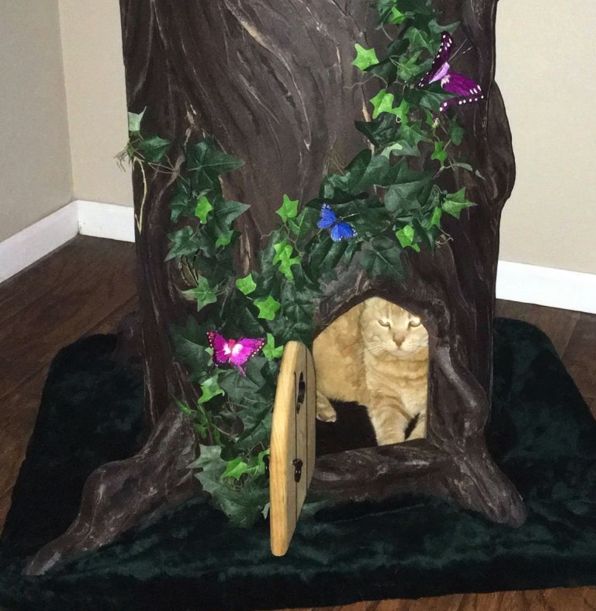 Spoil your kitties with a Fantasy Cat Tree! 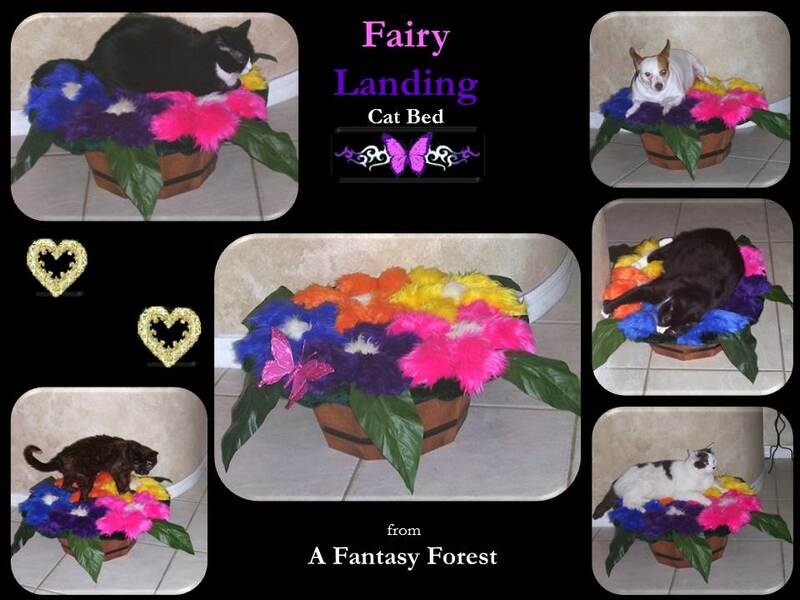 ~Fairy Landing~ Cat Bed and Scratcher all in one cute Tree. 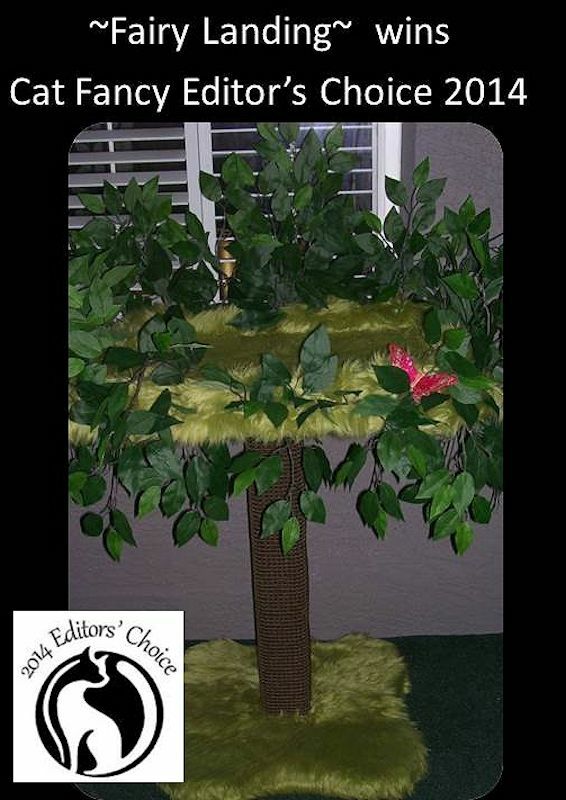 Completely Customizable to match your own Décor. 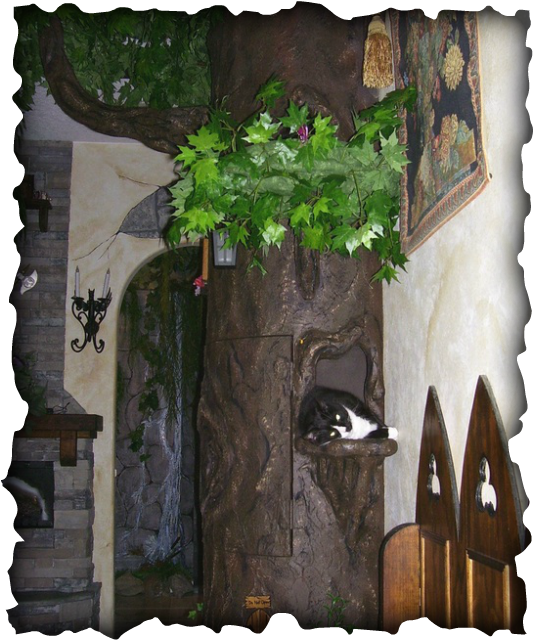 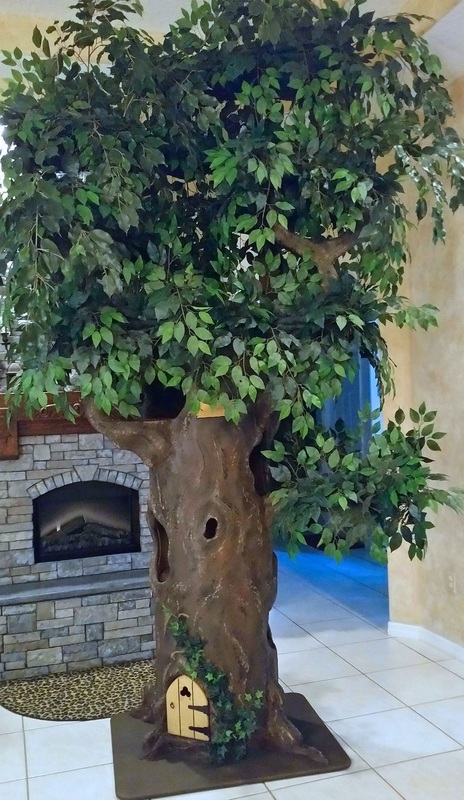 Fantasy Cat Trees for Spoiled Rotten Kitties! 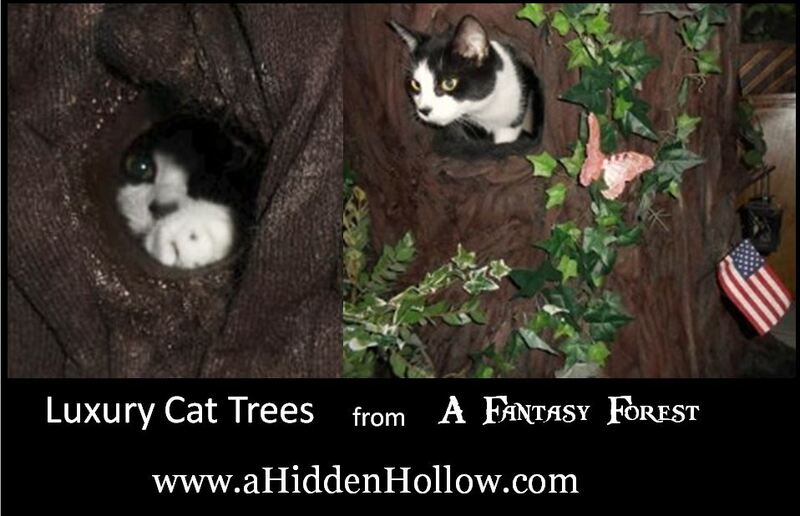 Please visit us at www.aHiddenHollow.com and Design a Cat Tree for your Precious Kitties. 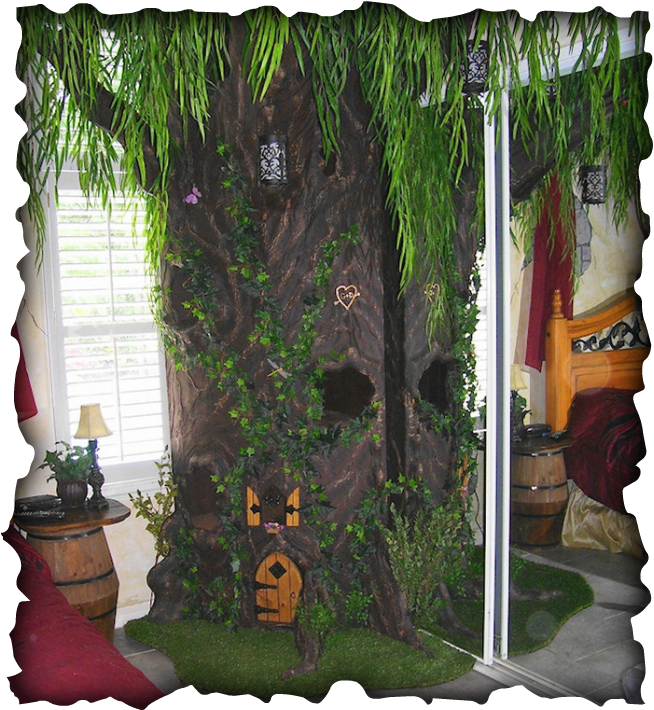 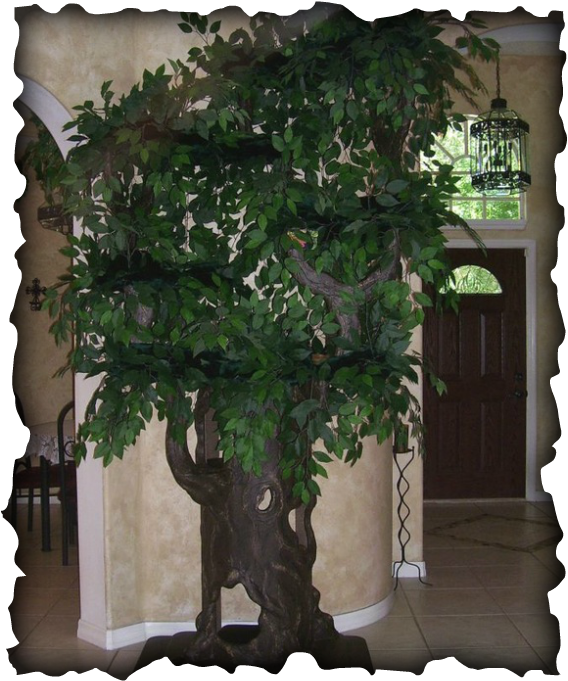 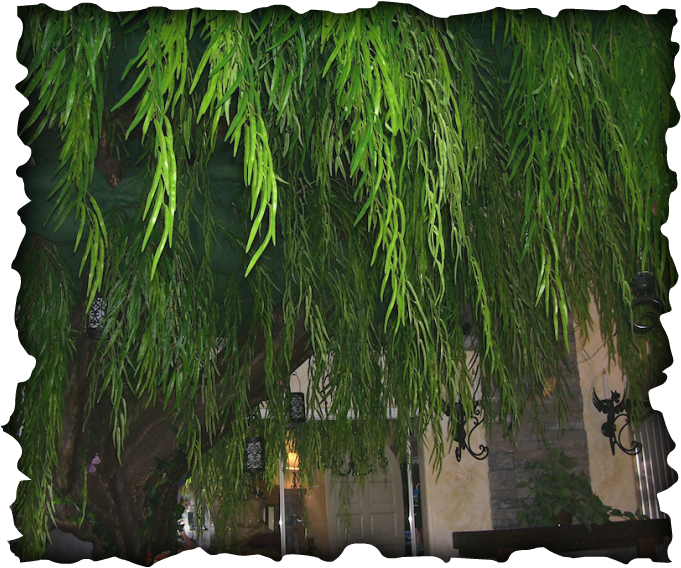 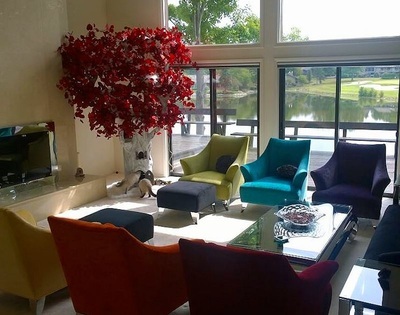 You can design very Realistic looking Trees, or Magical Fairy-tale Trees, or Wild and Vibrant Trees to brighten your House. 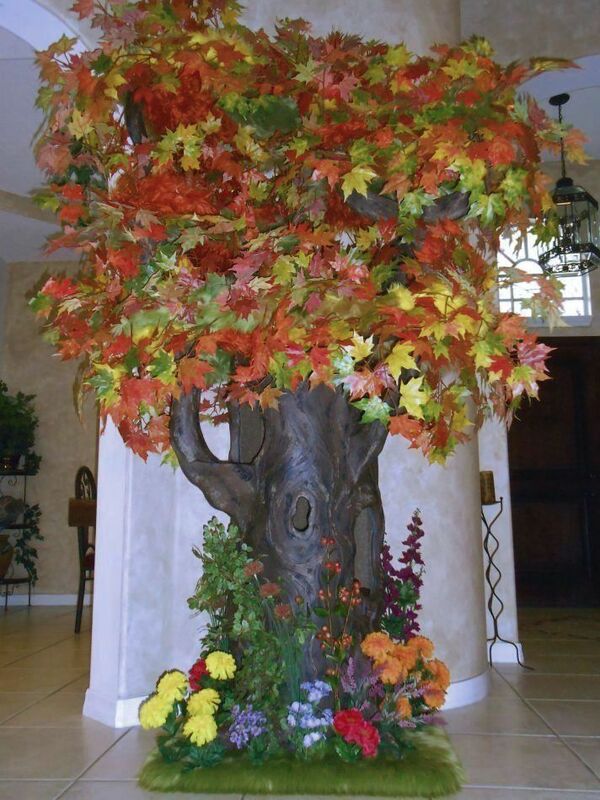 There is no limit to what you can create. 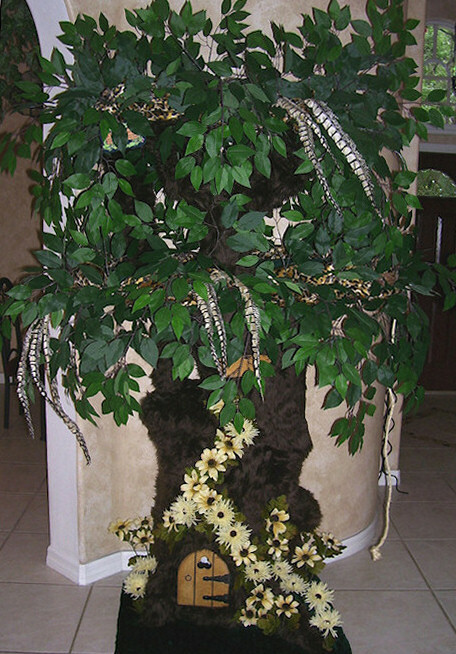 Some clients even add Fairy Lights and Nature Sounds to their Trees. 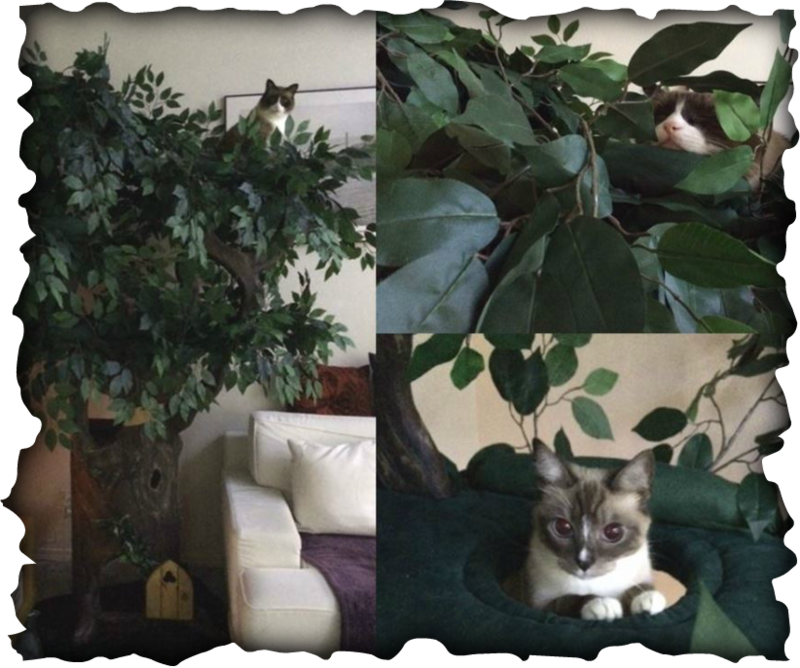 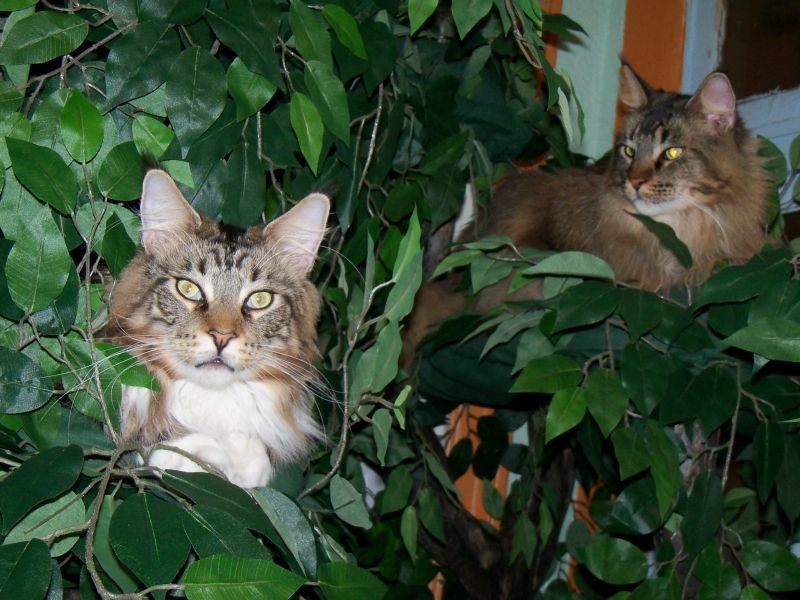 Create a "Forest" with Different sized Trees for your Kitties to jump back and forth on. 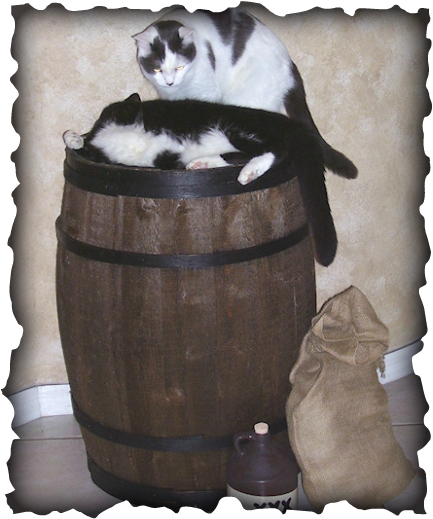 Add a little Ambience to your room with this faux Whiskey Barrel Pet Bed. 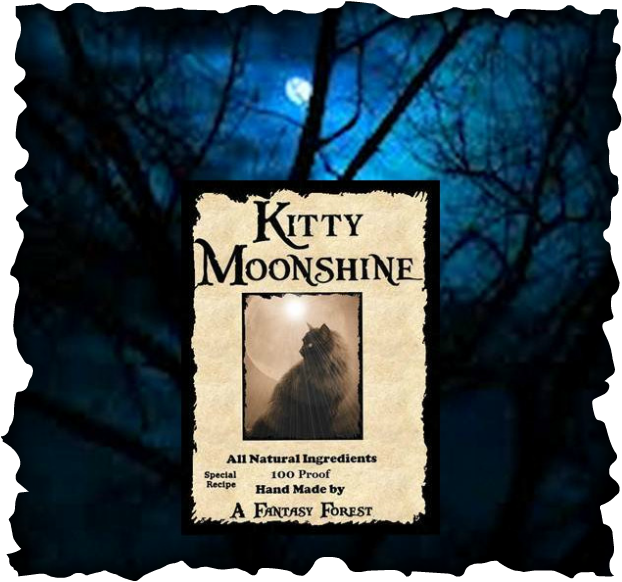 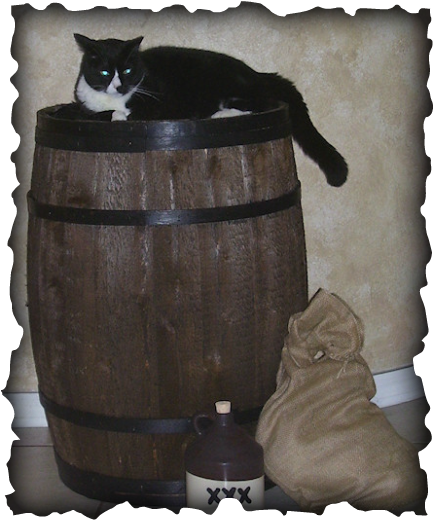 ~Kitty Moonshine~ is 30" tall and made of rough cut cedar with oak bands. 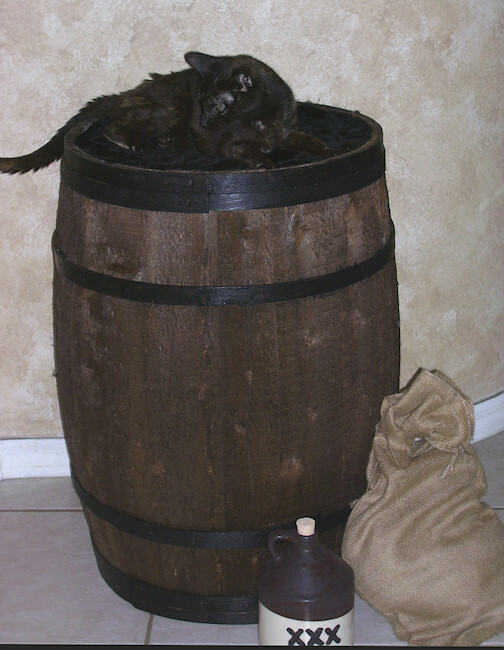 It is stained and painted to give it an Aged, Rustic look. 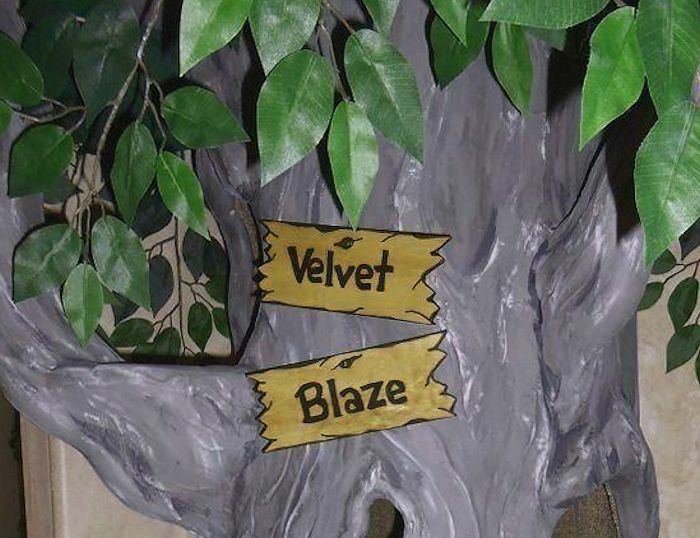 It's great for themed rooms too. 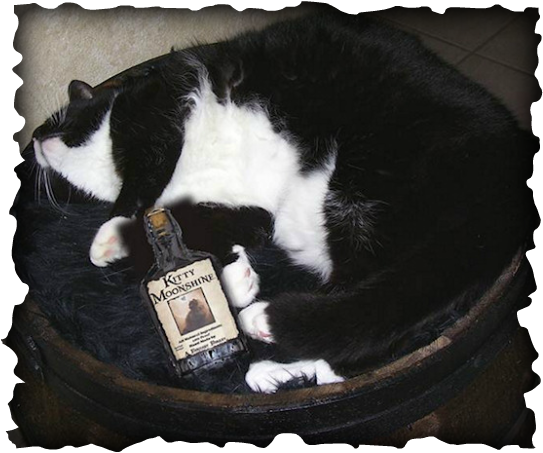 For those Elegant Kitties that prefer a more Refined Spirit, we have ~Kitty Cabernet~. 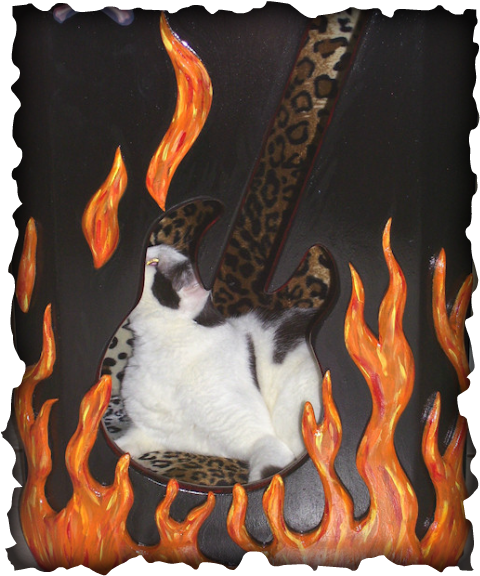 customize with your Cats name. 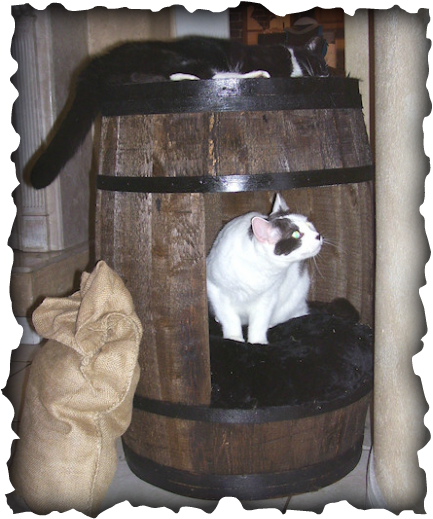 Delight yourself and your Spoiled Kitties with this Fun Cat Bed! 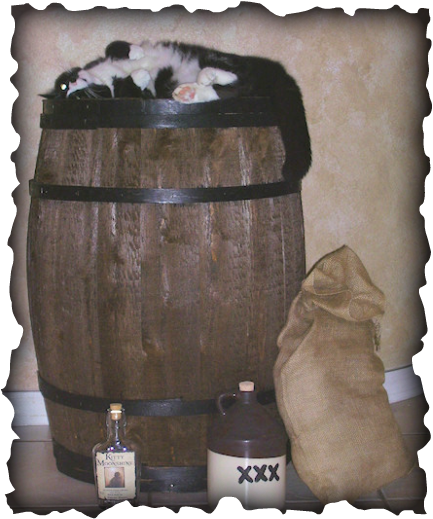 Wine, Moonshine Bottles and Jug are empty, sorry, we can't ship alcohol : ) they are props. 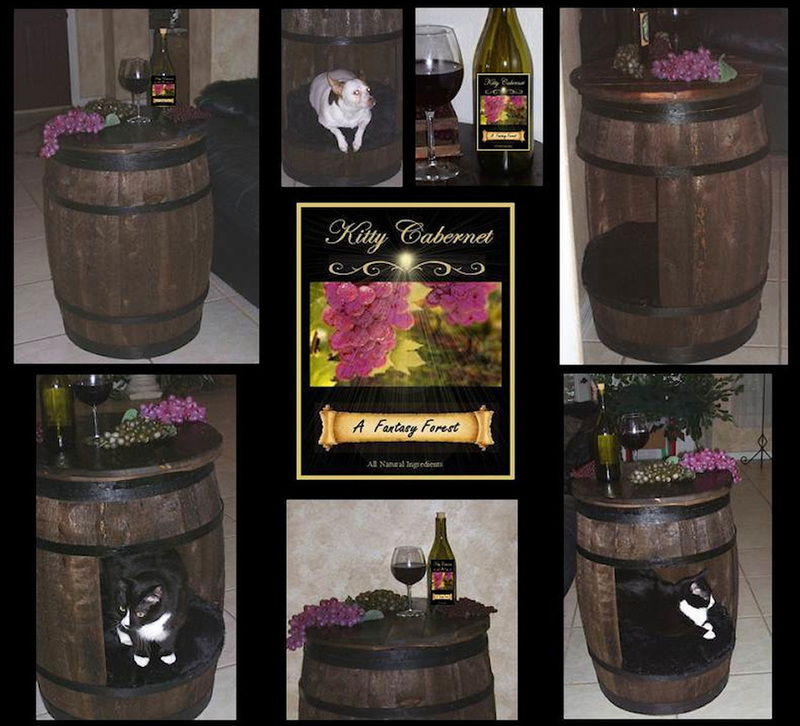 The wine glass candle has non-toxic gel wax that looks like red or white wine, and features merlot or chardonnay scents. 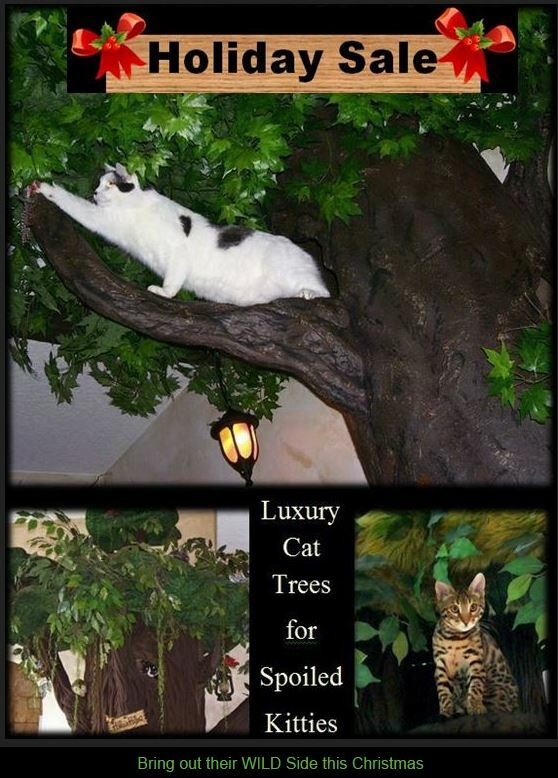 Unique Luxury Cat Furniture for Spoiled Rotten Kitties! 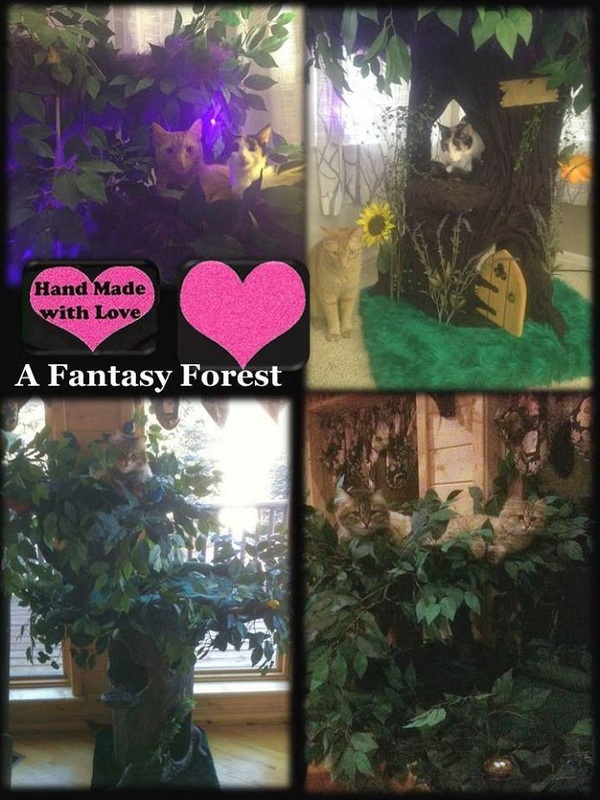 Delight yourself and your Kitties with one of these Fantasy Trees. 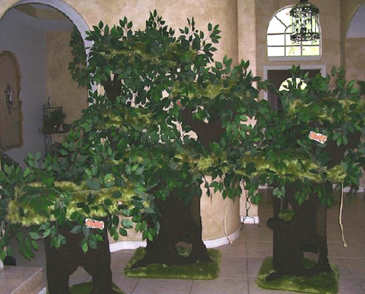 They are available in sizes 3' to 10' tall, so there is one to fit every lifestyle. 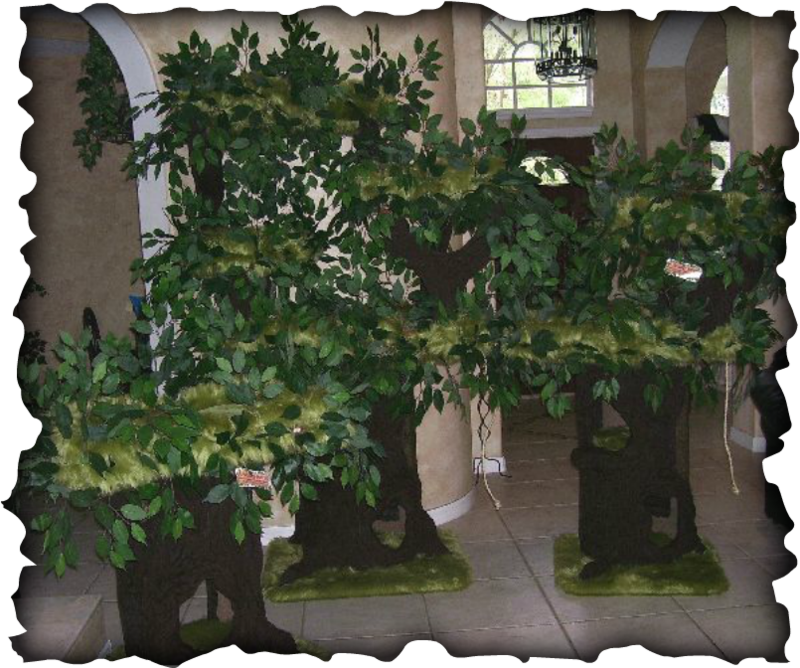 Each one is Handcrafted with a 100% wood frame and created to blend in with your Decor. 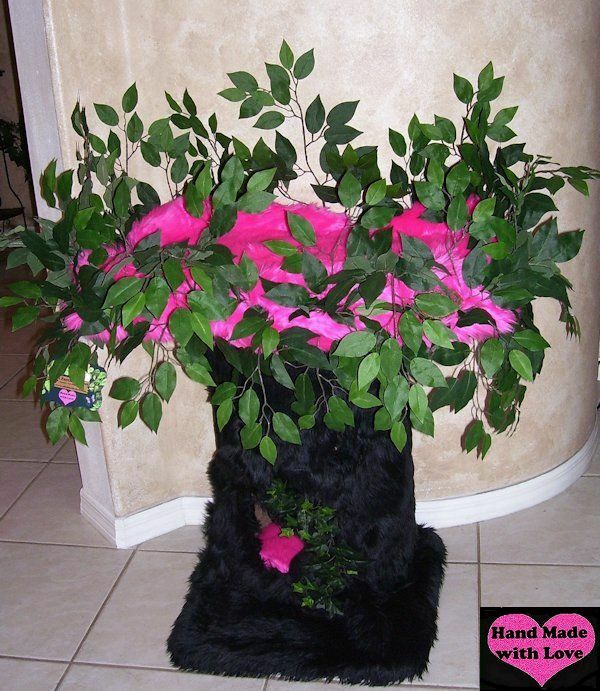 You can even Design them with your own Fabric. 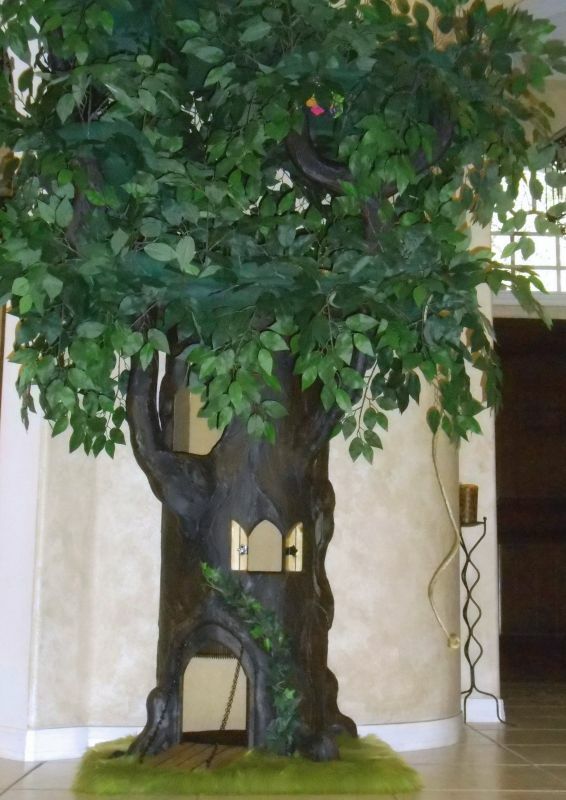 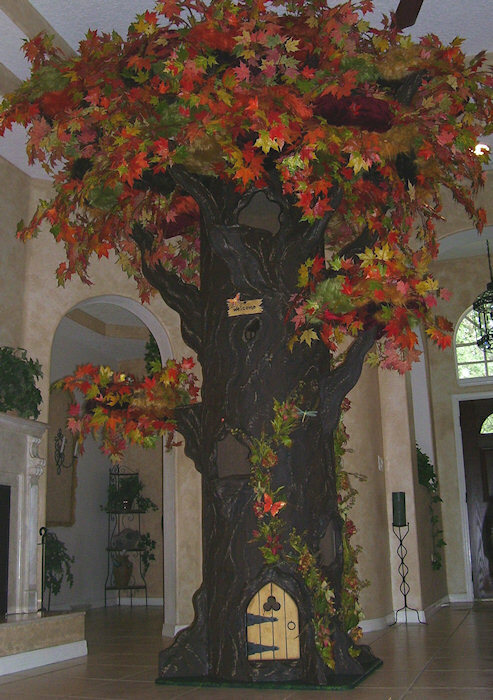 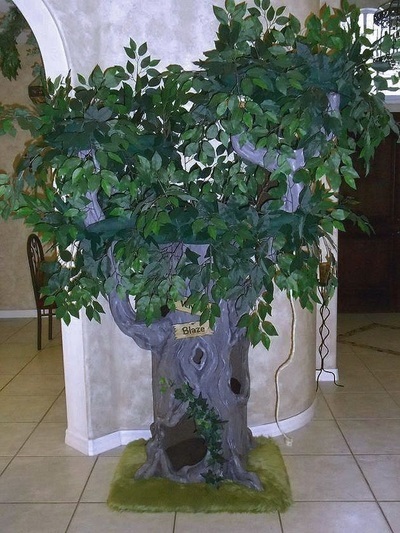 There are many add-ons and upgrades to choose from so you can create your own one-of-a-kind Tree. 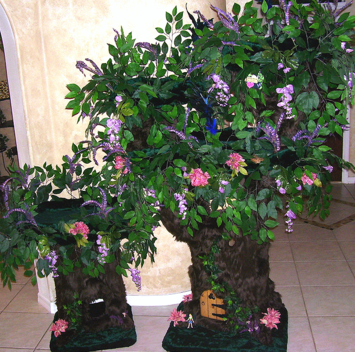 They are also available in different exteriors on the Tree Trunk and Branches. 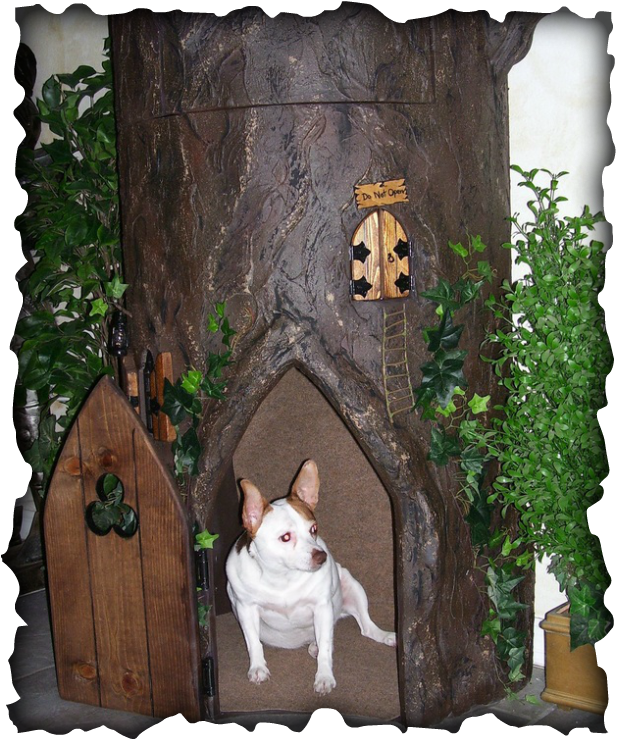 You can choose from Fabric Bark, Wood, or Luxury Fur. 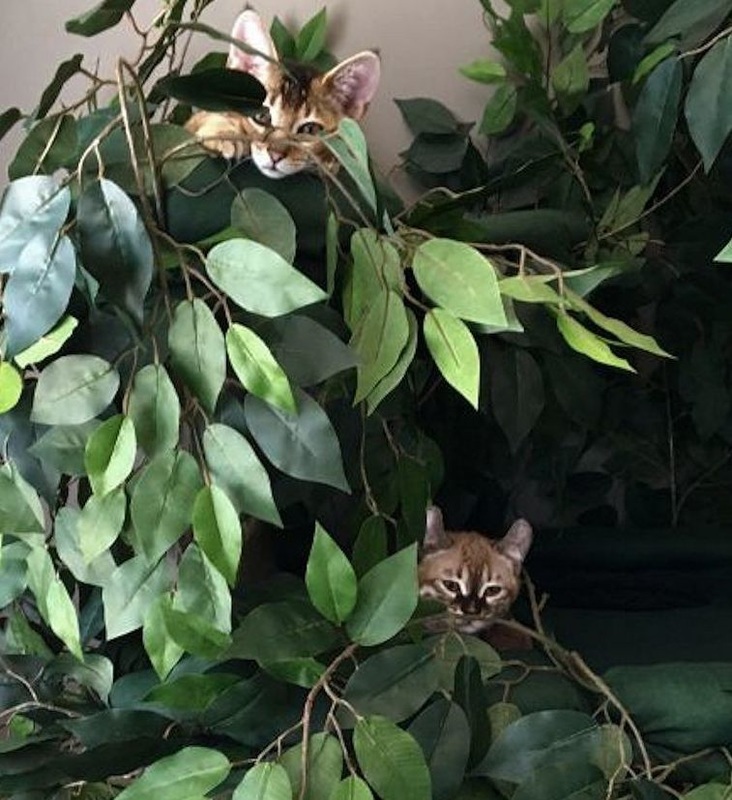 Bring out their WILD SIde!